Our long weekend in Jersey is almost at an end. 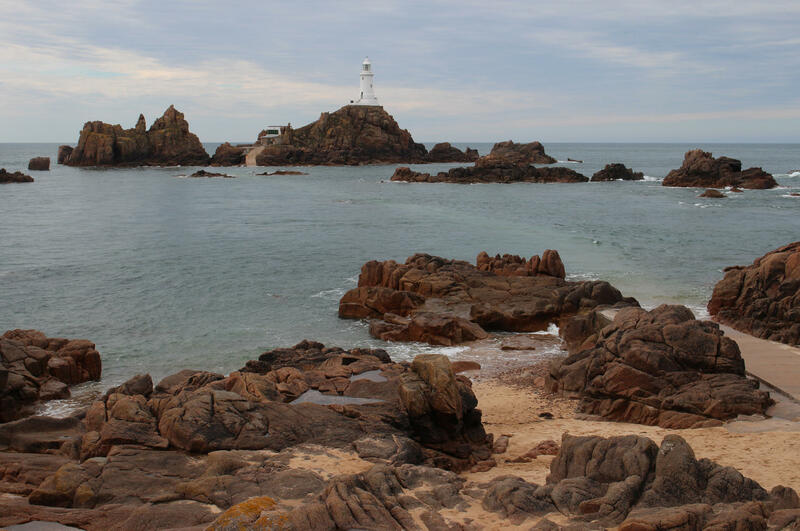 It has been a great trip and while I have seen plenty that has prompted nostalgia (especially visits to El Tico, Elizabeth Castle, Portelet and Corbiere Lighthouse) there has also been plenty that has been new to me. 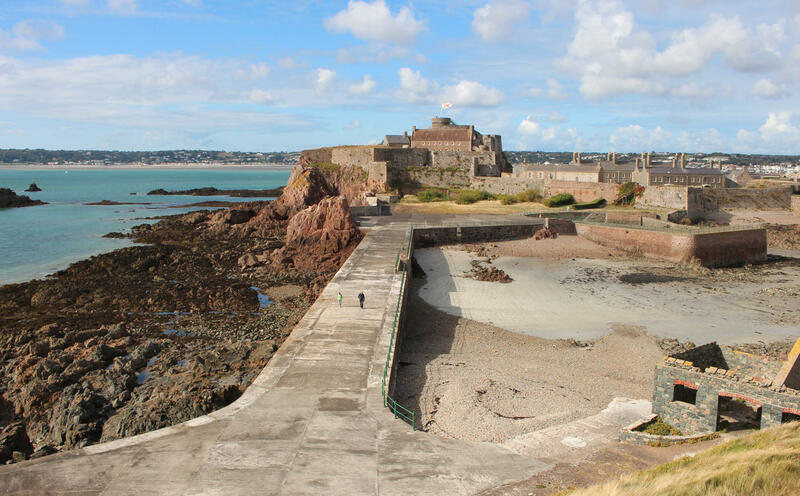 It’s the first time I have stayed outside St Helier and I loved every minute of our time in St Aubin, especially with so many great restaurants on our doorstep. Throughout my trip I have been surprised by changes good and bad. One of the nicer surprises was the modern art on display at Mont Orgueil in place of the stuffy waxwork diorama that I remember from my childhood. 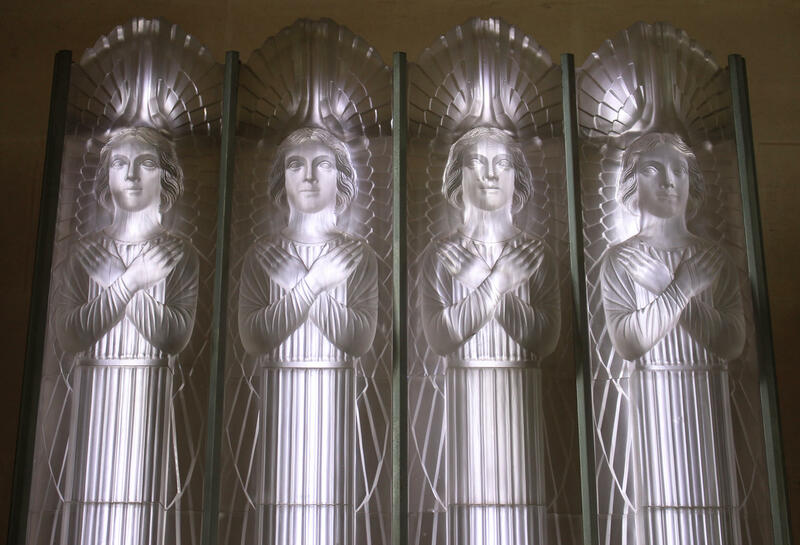 These new artistic sights include a stunning steel sculpture showing the tree of succession for medieval monarchs (the interlinked French and English crowns from 1154 to 1485), some three dimensional portraits of the Queen and the rather creepy shadows created by a rotating dance of death sculpture in the Bell Tower. Another unexpected highlight was the exhibition at La Hougie Bie about the Jersey Hoard, showing some of the star finds from the astonishing discovery in 2012 of 70,000 coins stuck together in a great mass with gold torques and silver jewellery. The story of the painstaking work to unpick this was fascinating as the display of the rare coins revealed. It has been a great trip and I doubt it is the last time. 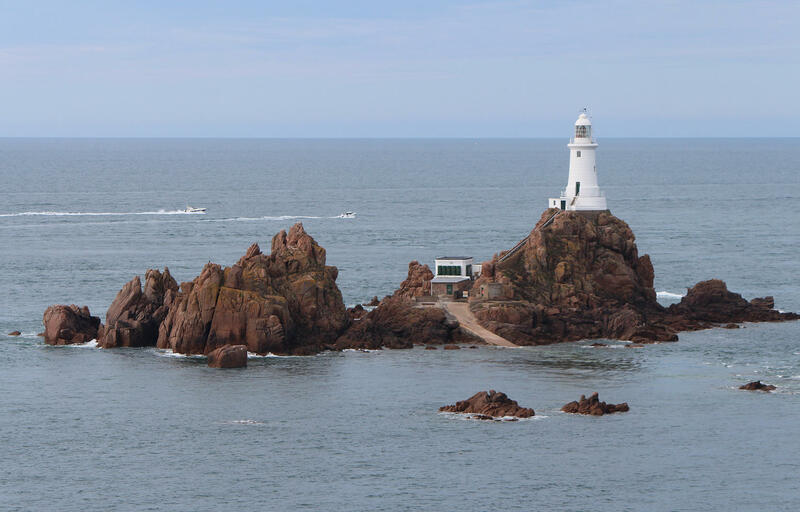 I have lost count of the number of time I have been to Jersey, but it must easily be into double figures by now. 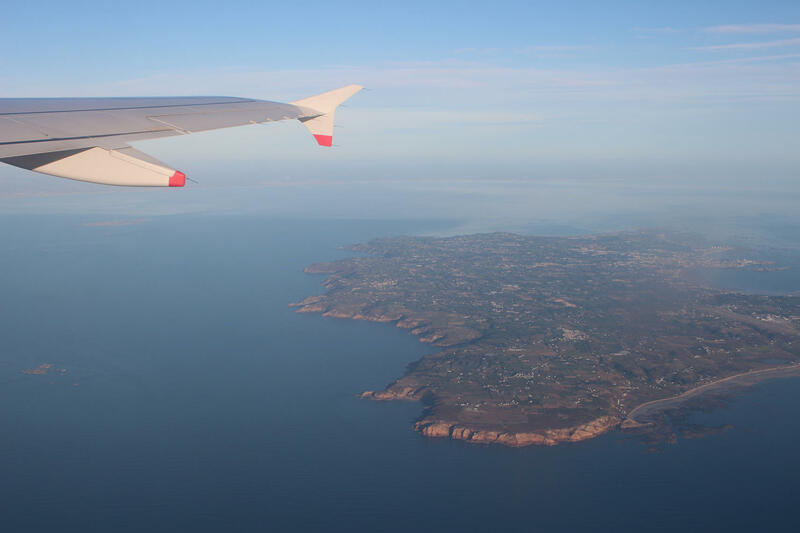 It is all the more surprising then that I have never been to Guernsey, unless you count the brief stop that the ferries used to make in St Peter Port on their way to and from Jersey! Nor have I been to the other Channel Islands. It’s probably about time to put that right… maybe next year, or the year after!? 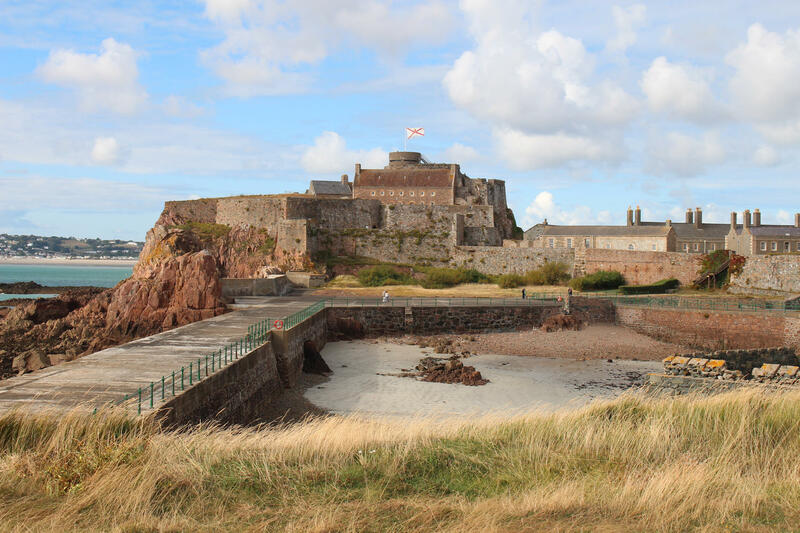 The island of Jersey has always been well fortified with 3 castles, 8 forts and 30 towers constructed around the coastline over the span of the past 800 years or so. However, the German occupation during World War II saw the island fortified to a degree that far exceeded anything that had gone before. 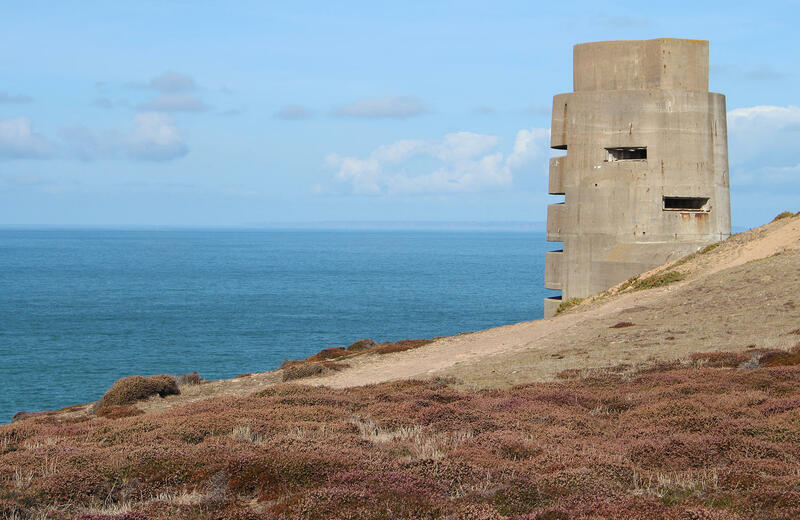 In just five years hundreds of defensive structures were built around the entire coastline as part of the German Atlantic Wall and existing fortifications were adapted to a new age of warfare. 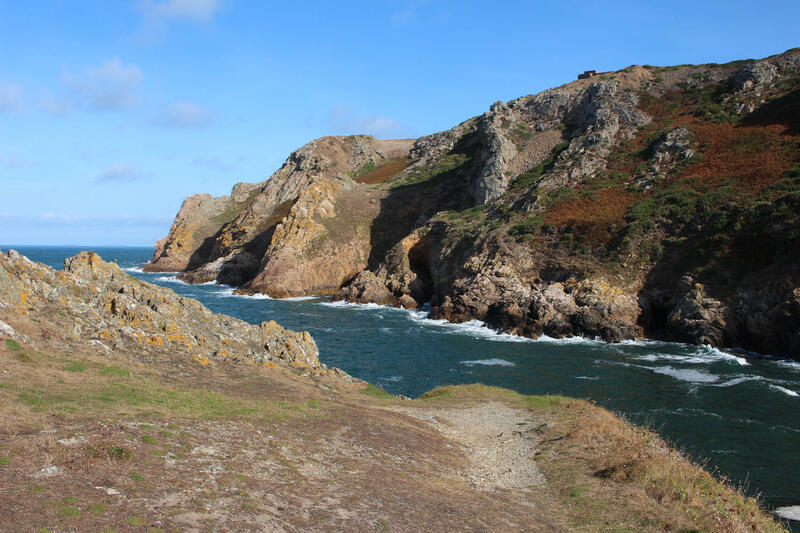 The scale of the works in the Channel Islands was immense. 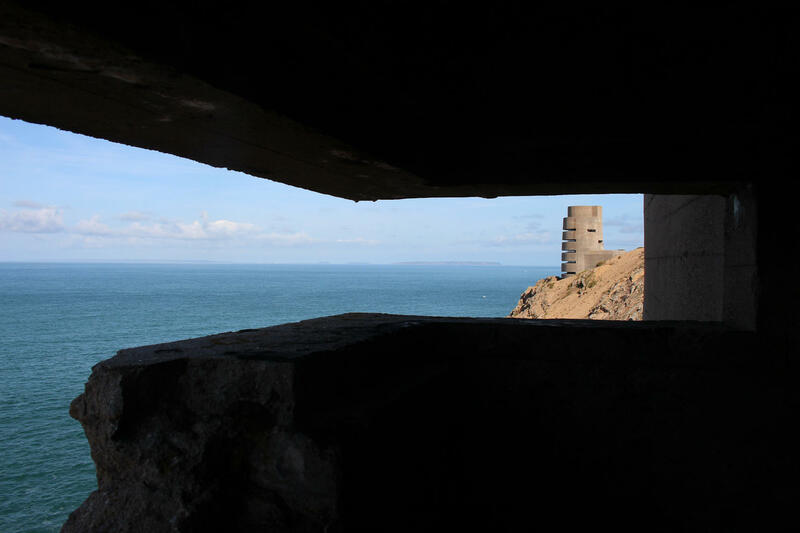 The amount of rock extracted from the islands during tunneling works exceeded that of the rest of the Atlantic Wall from from Norway to the Franco-Spanish border. The human cost of this construction was terrible, falling on 16,000 slave workers brought to the islands to work in inhuman conditions. Traces of their presence can be found in many of the sites, from scratched inscriptions to footprints left in setting concrete. At times it feels like you can barely walk a few metres without stumbling across a bunker, anti tank wall or a hidden gun position. Even when you find an apparently unaltered stretch of clifftop there can be less obvious works that are easily overlooked such as firing steps carved out of the natural rock. 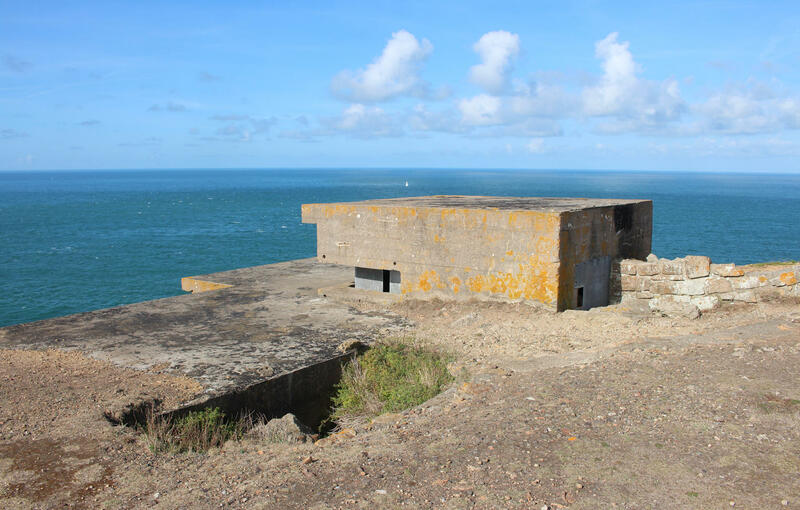 In other places the defensive works have become part of everyday life, adapted for new uses, such as the restaurant inside the bunker at L’Etacq. 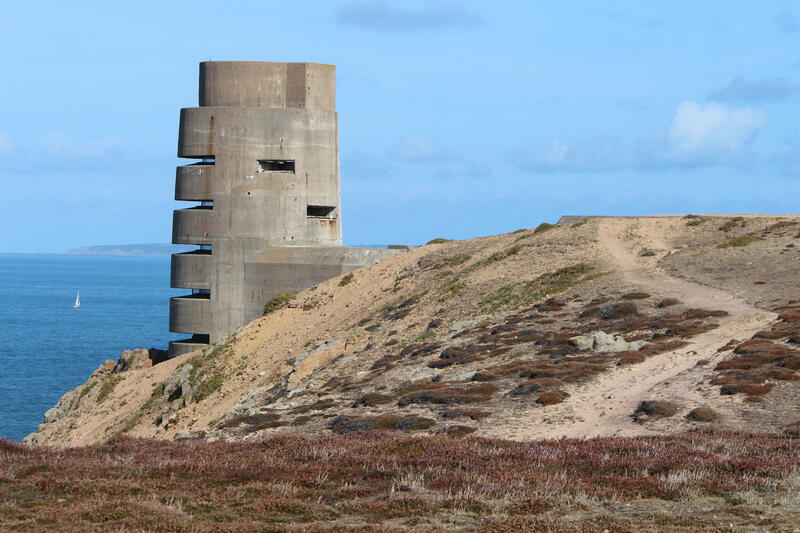 The challenges of preservation must seem overwhelming at times when balanced with the scale of the construction here, but the work of the Channel Island Occupation Society has been instrumental in ensuring that the story of the occupation can be passed on from one generation to the next. 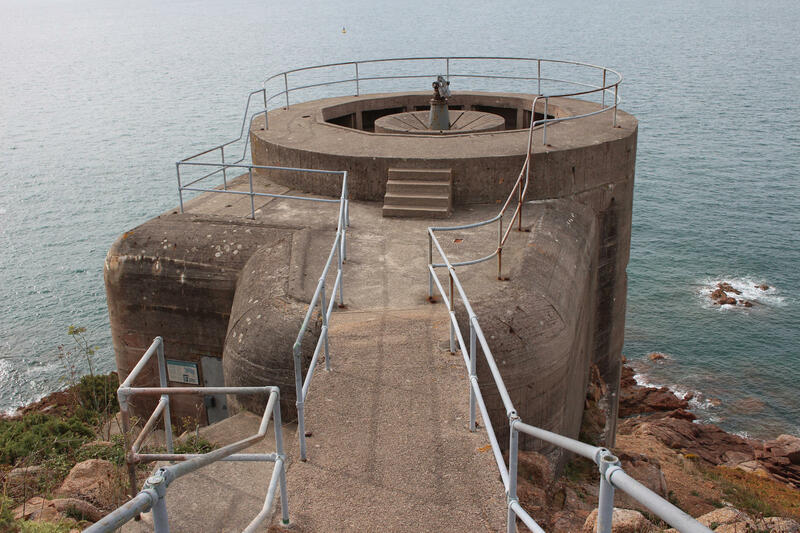 Some of the bunkers on Jersey have been carefully restored (even including the casting of a new armoured range-finder turret at Noirmont) and they are now considered to be the best-preserved collection of German Second World War defence works in Western Europe. 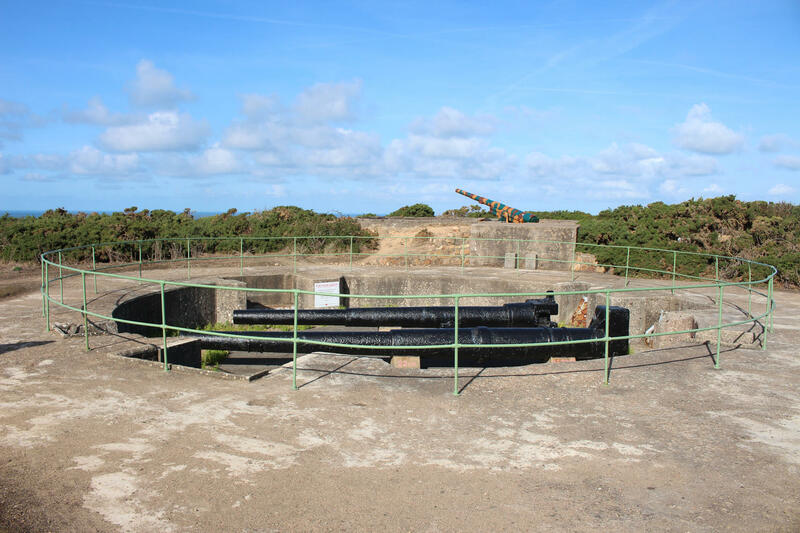 Five bunkers are regularly opened to the public by the volunteers of the Channel Islands Occupation Society and we took the opportunity to visit two of these – Batterie Moltke and Strongpoint Corbiere. 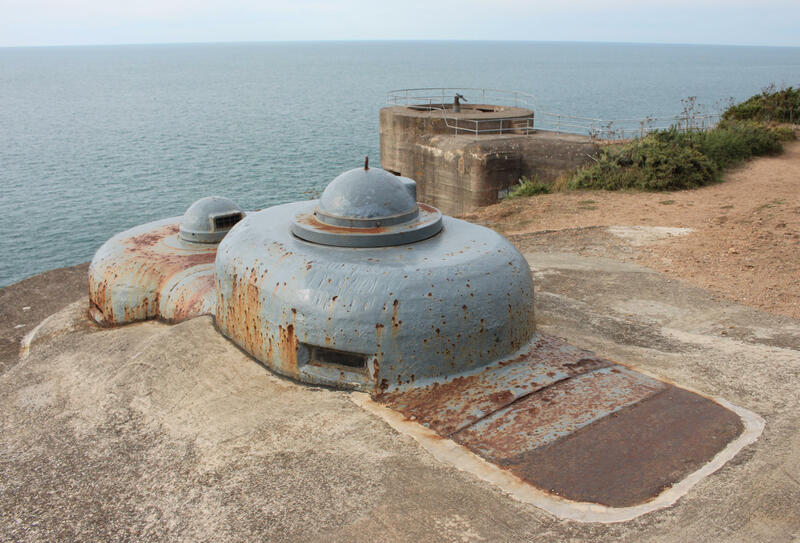 The first bunker we visited, Batterie Moltke was barely visible on the surface but was surprisingly extensive once you got inside. 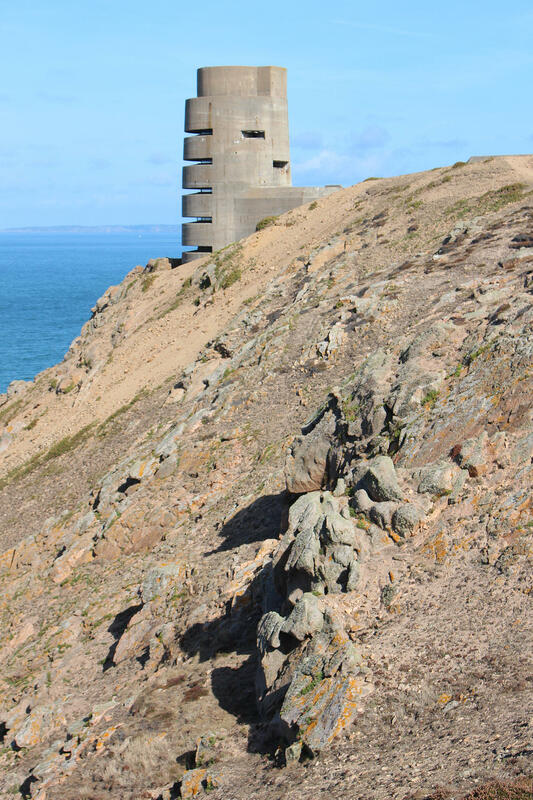 A more visible landmark on the coast was close at hand – the concrete skeleton of a MP 3 Naval Artillery Direction and Range-finding Tower now shorn of its rooftop radar. 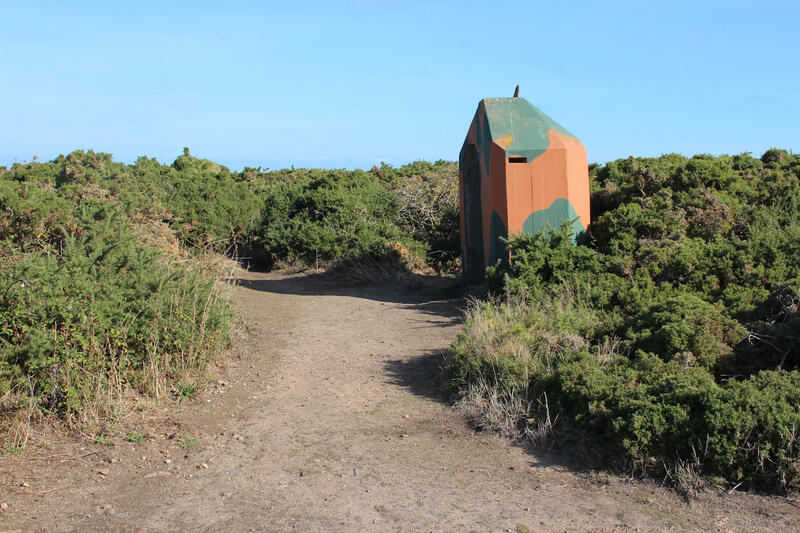 The second bunker at Strongpoint Corbiere was a bit more obvious, but still didn’t look like much on the surface. 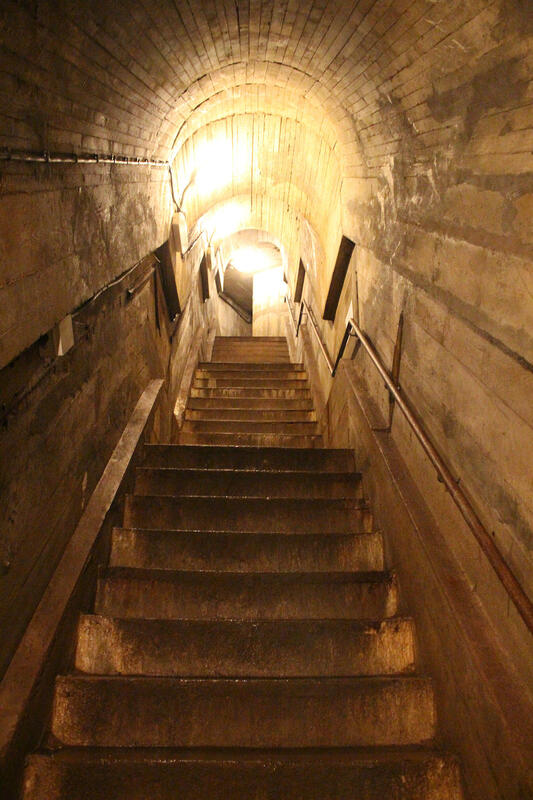 Once we stepped inside the M19 bunker at Corbiere we discovered just how wrong those first impressions could be – it inclues an underground passageway that leads to a nearby Sechsschartentürm Heavy MG Turret Bunker. The personal recollections of the former crew really brought the place to life with tales of fishing for lobsters and hiding stashes of potatoes in ammunition boxes, safe from the prying eyes of superiors. 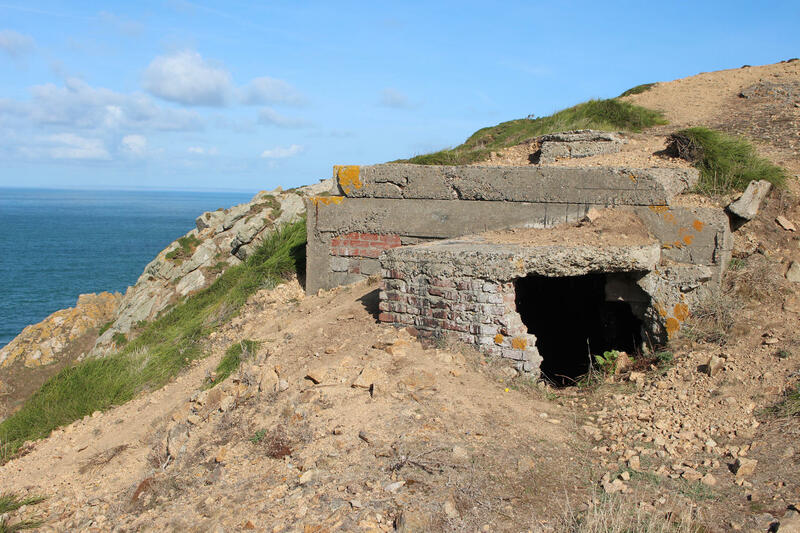 I will have to come back on another occasion to take a look inside the three remaining sites – Batterie Lothringen, Resistance Nest Millbrook and Resistance Nest La Mare Mill. 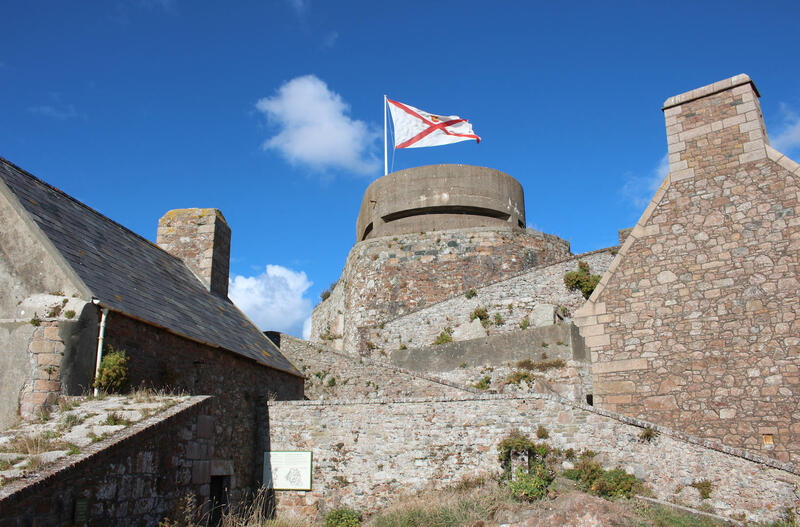 The highlight of most childhood holidays to Jersey was a visit to Elizabeth Castle. 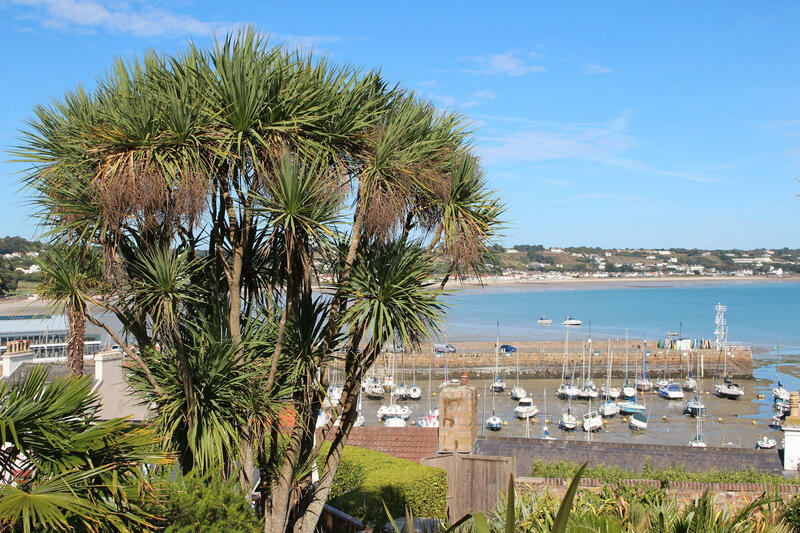 It is spectacularly located on three interconnected islands in St Aubin’s Bay and surrounded by the sea for much of the day. 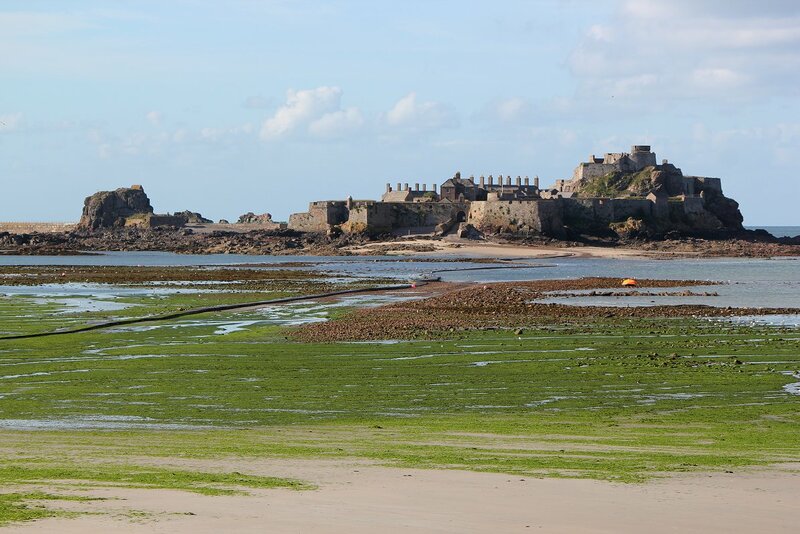 At low tide you can walk out to the castle on a 1km causeway but when this is covered you can take an amphibious vehicle out to the entrance. The novelty of the approach just added to the excitement and the moment we stepped back onto that causeway I could feel that infectious childhood enthusiasm creeping back upon me. 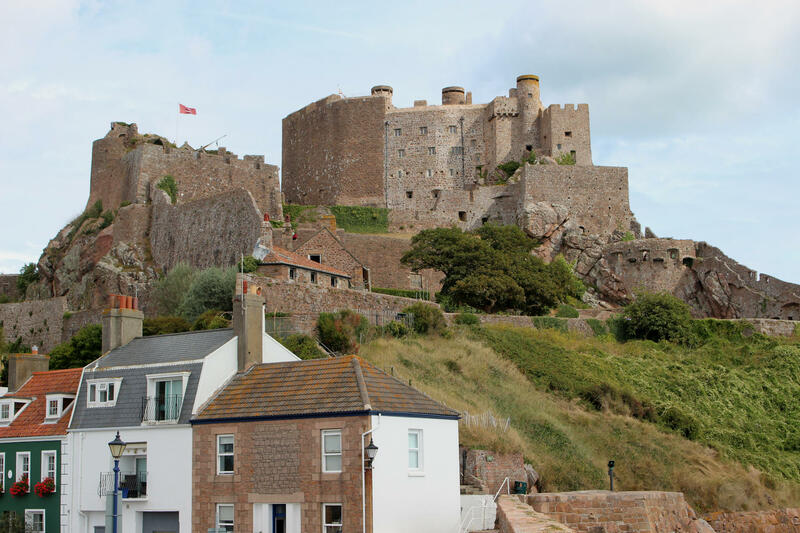 The first phases of the castle were constructed at the end of the 16th century and when complete the official residence of the Governor was transferred from Mont Orgueil. 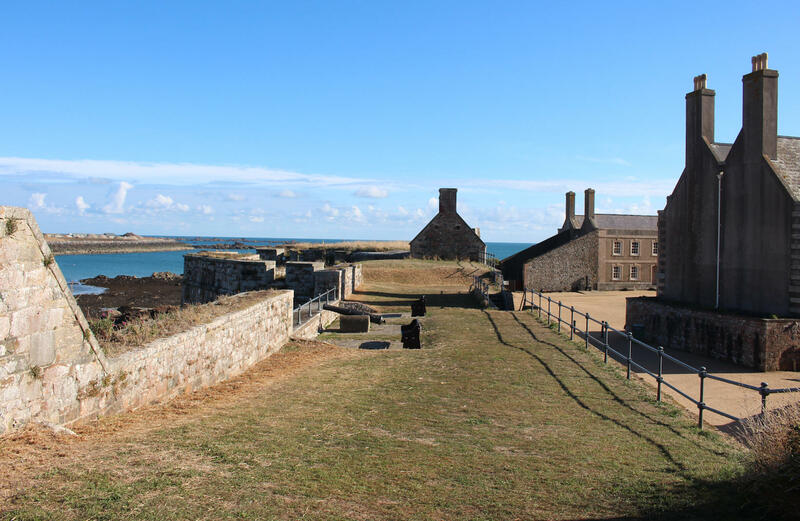 The castle was originally named Fort Isabella Bellissima after Elizabeth I by Walter Raleigh (Governor of Jersey, 1600-1603) and became the royal residence when Charles II sought refuge on the island in the 1640s. 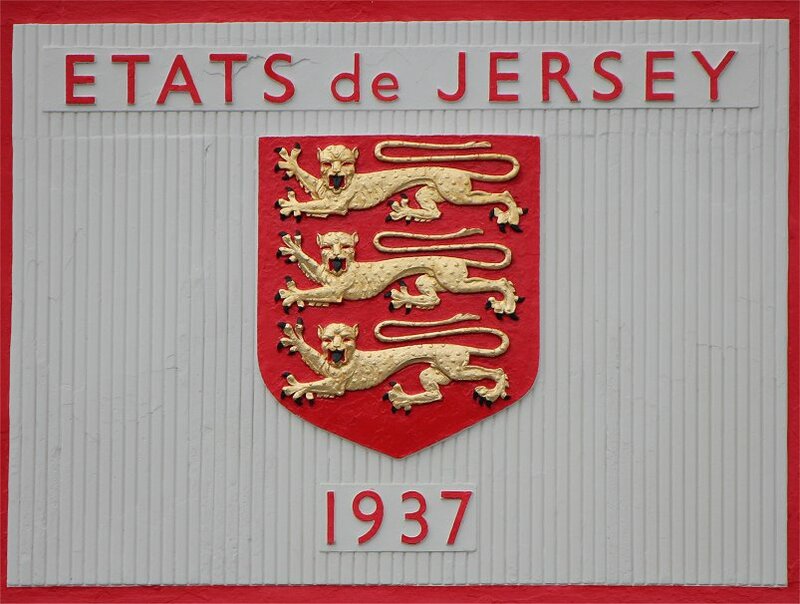 Jersey was the first place in the British Isles to proclaim Charles II as king, 18 days after the execution of Charles I. There is an earlier structure connected with the castle. 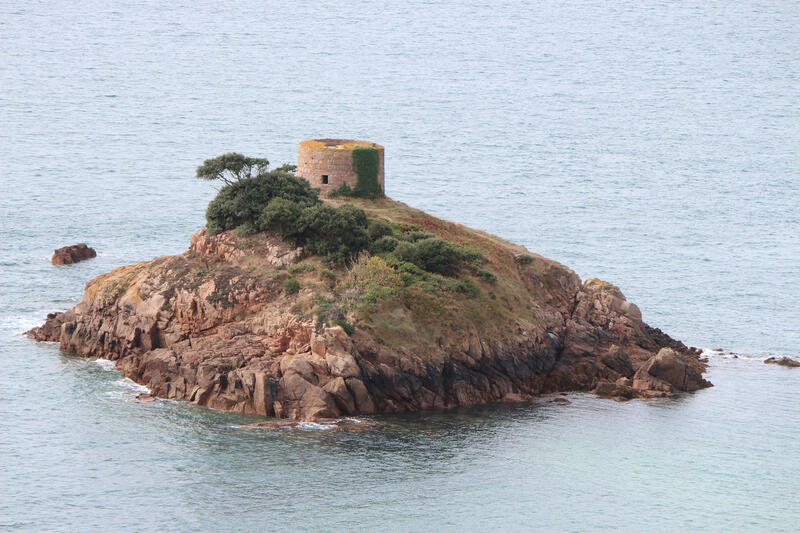 In the 6th century a hermit named Helibert, better known today as St Helier, settled in a cell in a rocky outcrop south east of L’Islet. From this vantage point Helibert was able to keep a watchful eye for pirates and warn the locals – until one day they caught up with him. The pirates cut off Helibert’s head but legend says that he just picked it up and walked to the shore. Around this time L’Islet became a religious site – first with a monastery (6th-9th century) and then with an abbey in the twelfth century. 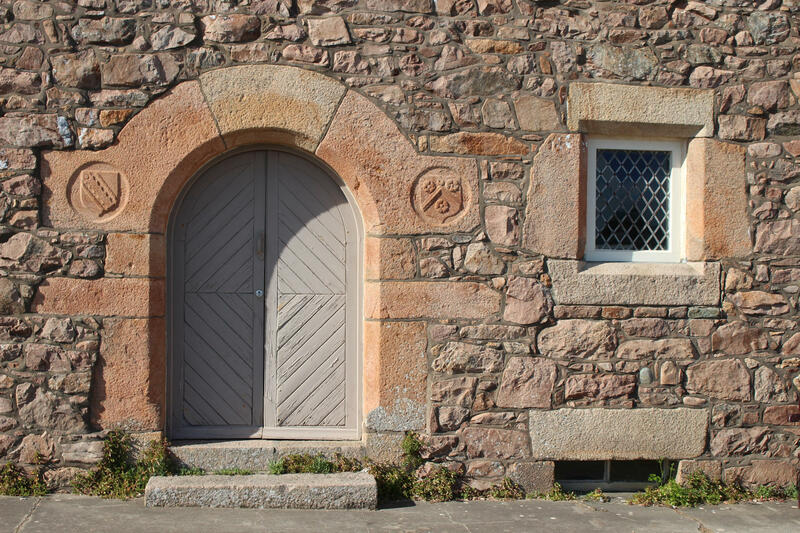 A chapel was built on top of St Helier’s cell in this second phase of religious in-habitation, which remained an isolated spot until it was connected to L’Islet with the construction of a breakwater in 1872. 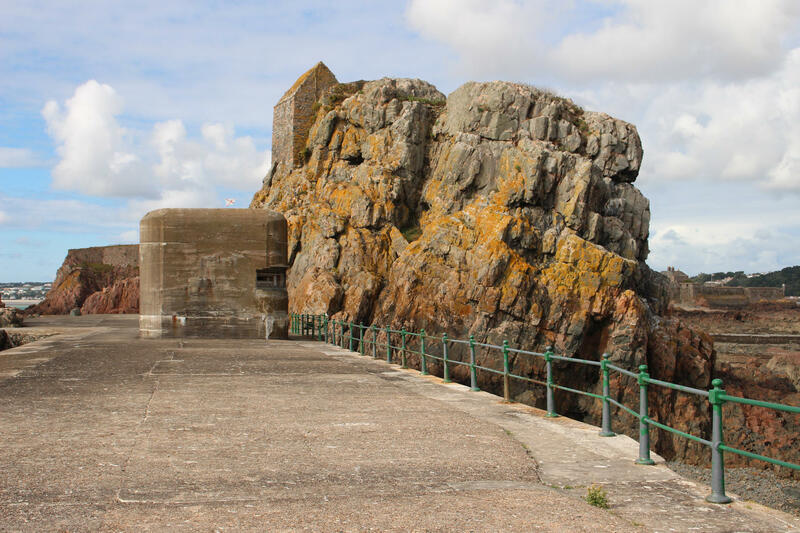 In a strange echo of its past, a concrete bunker with 2 metre thick concrete was constructed next to the hermitage during the occupation with space for a solitary soldier to guard the seaward approach to St Helier. 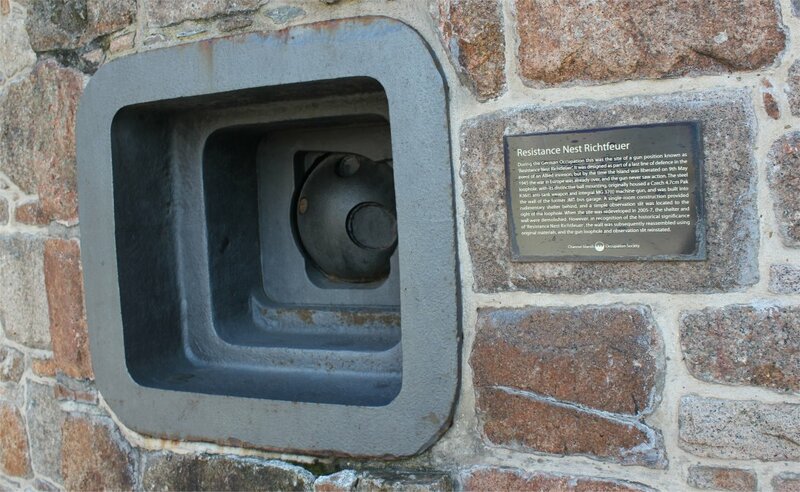 This lone individual had the task, if required, of remotely detonating a string of mines located on the seabed at the entrance to St Helier’s harbour. 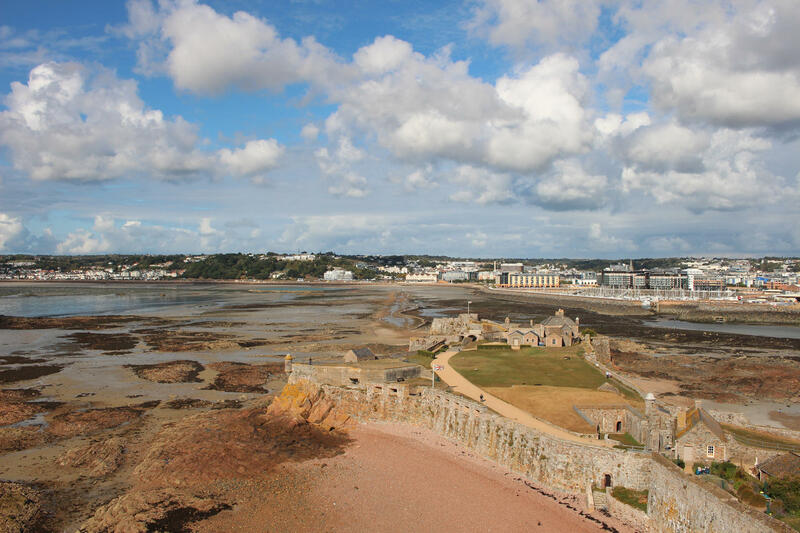 The later history of Elizabeth Castle is fascinating. In essence you had a castle that was preserved as a visitor attraction in the 1920s which should have been the end of its development, but instead a further evolution of the structures and arnaments was carried out during the German occupation. The modernised castle was a statement about control of the island as much as it was about the external threat from sea. I had hoped that by now the many 1940s additions to the castle would have been better presented and explained than in my past visits, but no such luck. I think that is a pity as this is a unique site with some rare constructions and extraordinarily well integrated bunkers that you barely notice on a wander, such as a Type 621 Personnel Bunker discretely hidden behind a wall that looks much older. 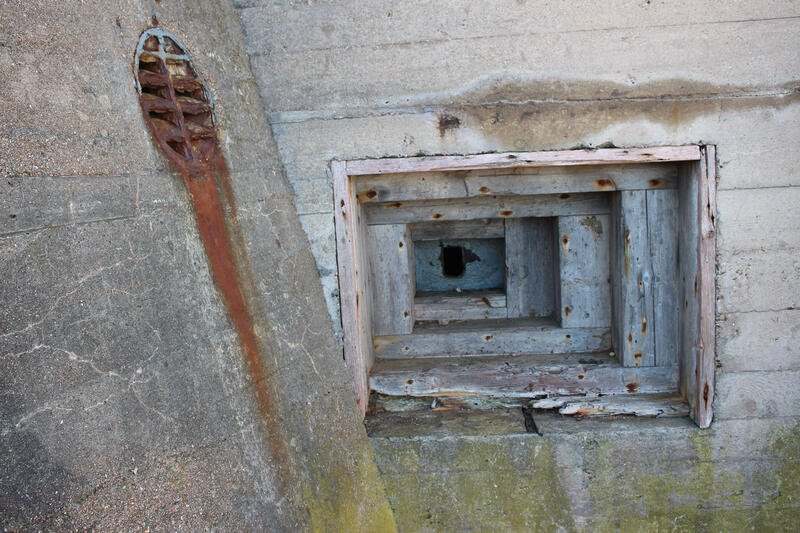 A comparison of the condition of the gun emplacements and tracks today with my photographs from the 1980s shows that they have deteriorated significantly since we last visited. 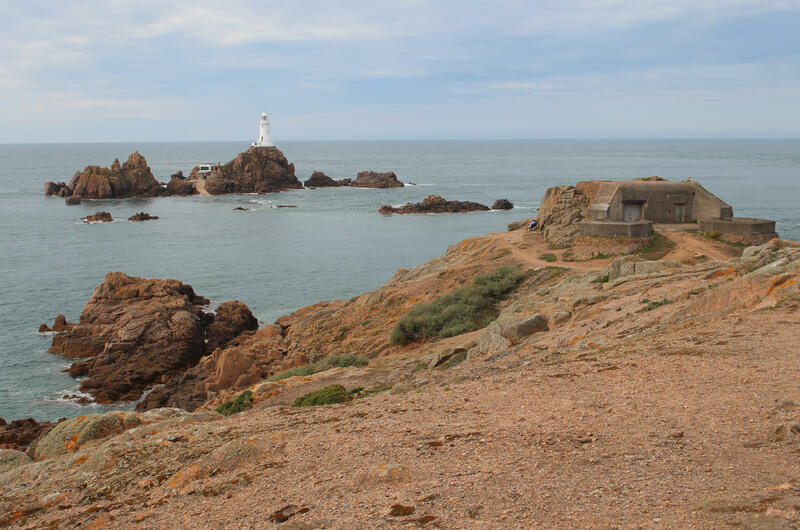 The Jersey War Tours team have done a terrific job of surveying the elements added between 1940 to 1945, providing a sobering assessment of the condition of the surviving features with recommendations for restoration and maintenance. I really hope their suggestions are acted upon and that this period in the castle’s history can be preserved for future generations before it is too late. It’s a fascinating story and one that needs to be told. I thoroughly enjoyed my return to Elizabeth Castle after an interval of 33 years. As a child it seemed an amazing place, but as much as I loved it I don’t think I quite appreciated just how unusual or special it was with its strangely elongated footprint and peculiar history. 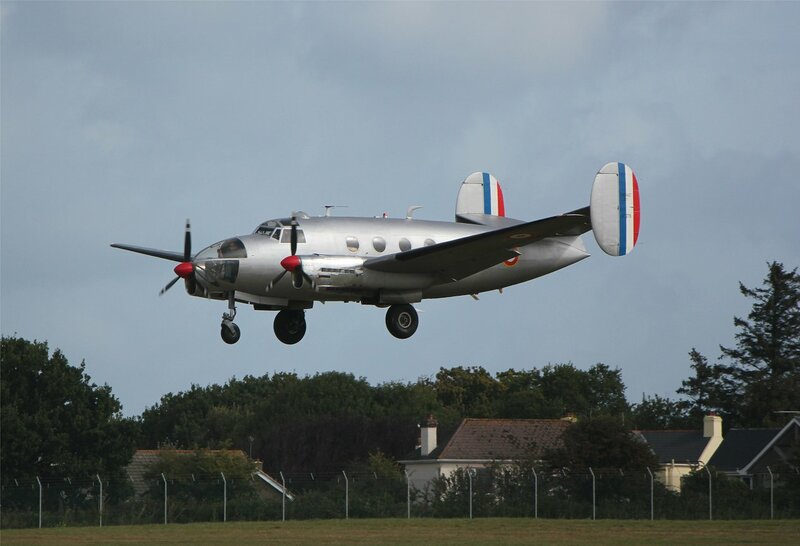 Nor did I understand just how extensive the 1940s modifications had been. It was good to get a better sense of all that amidst the nostalgia-fest! We left the castle shortly before the gates closed for the day and took a slow saunter back to the esplanade, then headed over to the Old Station Cafe for a superb Thai meal and a view of the sun setting over the castle. It was almost dark as we returned to St Aubin, which turned out to be perfect – allowing me to enjoy the long forgotten spectacle of the lights coming on across the entire bay. 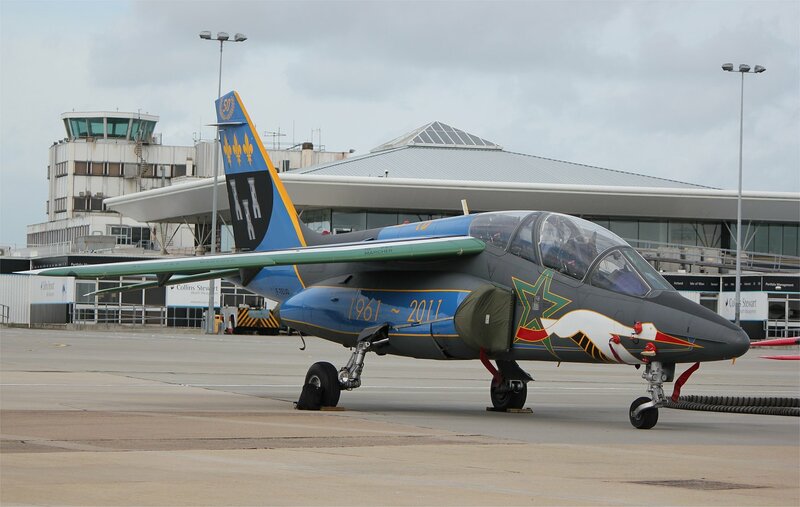 The Jersey International Air Display is always a splendid free event, usually throwing up relatively unusual aircraft along with some old favourites. 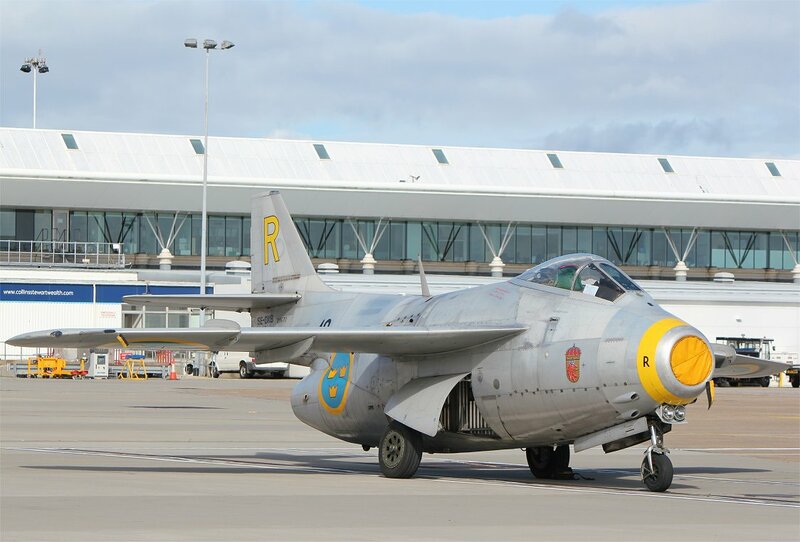 This year was no exception, with my highlights including appearances from the Swedish Air Force Historic Flight (J35 Draken and SK37E Viggen), a pair of Dassault Flamants and the world’s last flying Noratlas. 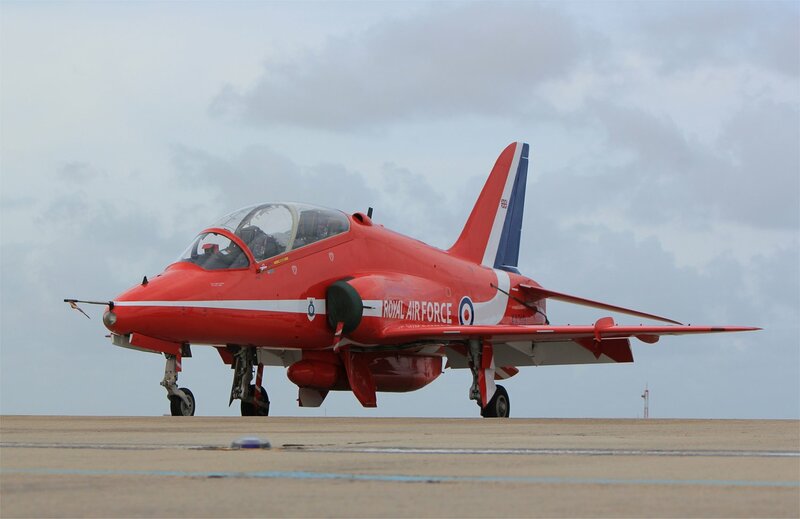 Needless to say, the show ending display from the Red Arrows was as stunning as ever. 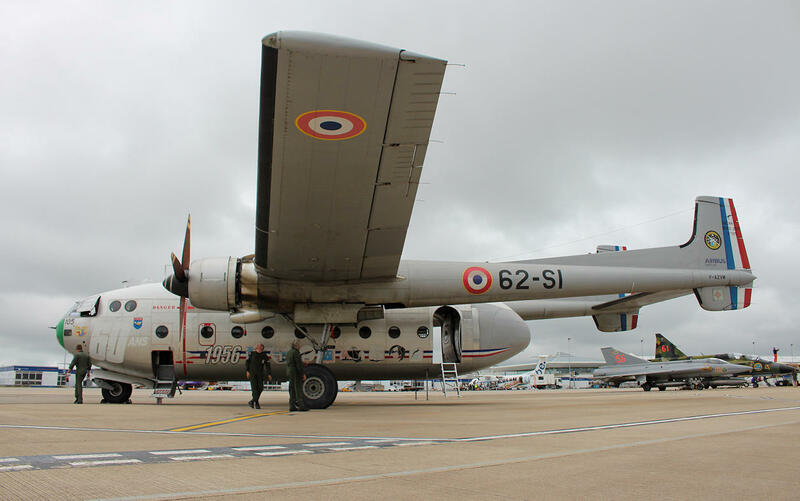 I must confess that I had never heard of the Noratlas, a military transport aircraft manufactured by Nord Aviation in France between 1949 and 1961. 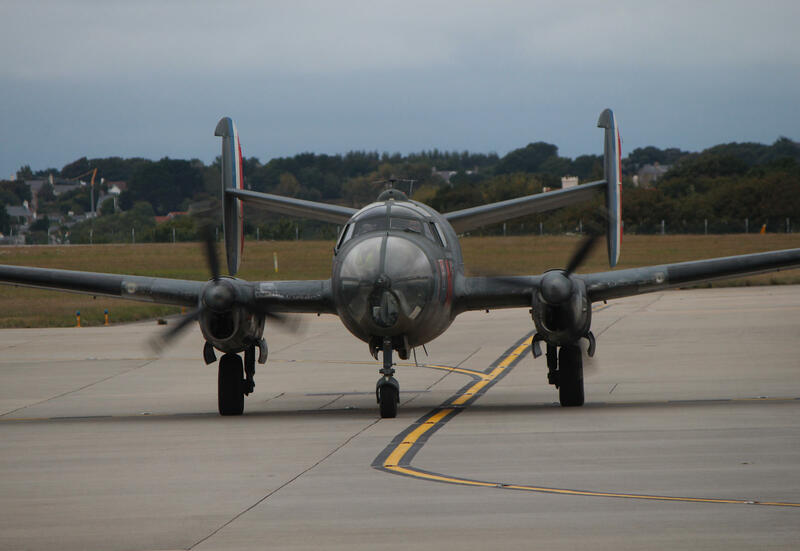 Over 400 of the type were built and mostly saw use with the military in France, Greece, Israel, Portugal and West Germany. The retirement of the Noratlases began in the 1970s but a handful survived in service with the French military until the 1980s. 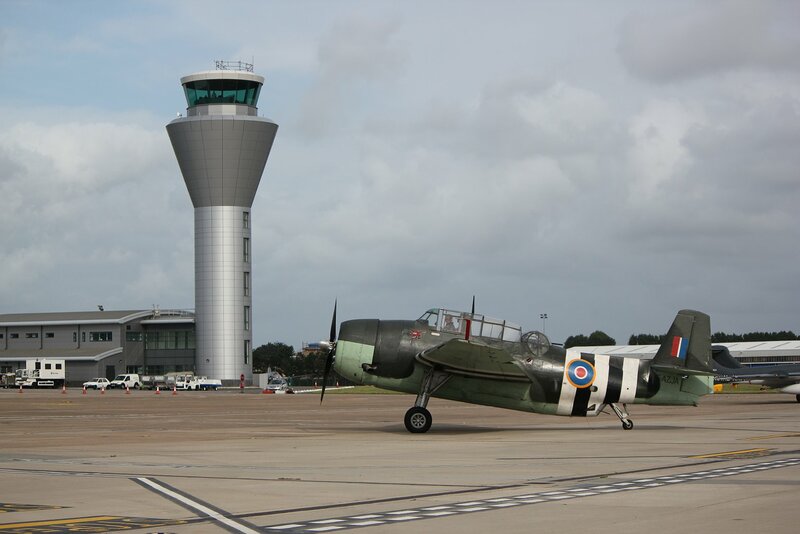 The weather was a little uncooperative in the build up to the event with many aircraft flying in later than scheduled, but the conditions were beautiful on show day. 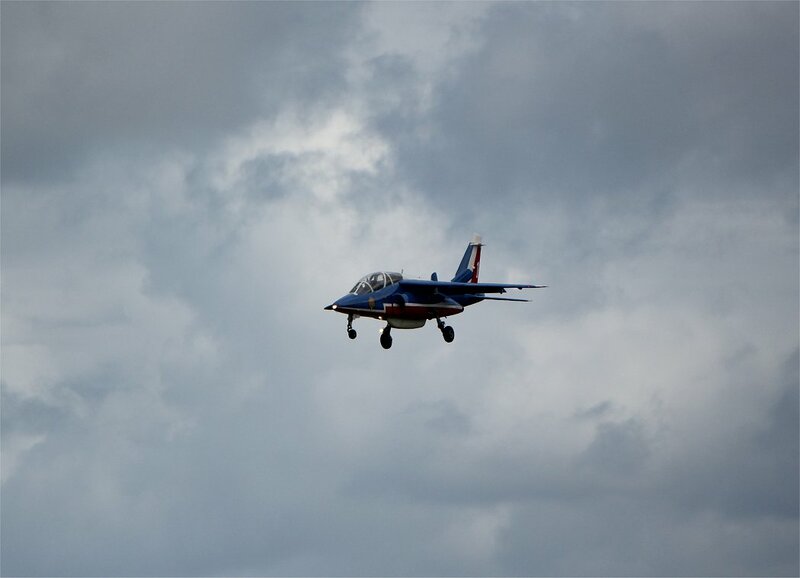 On this occasion I attempted to get some shots of the local scene with the aircraft flying over head, rather than going for the tight close ups I might try at any other show. The shots are not particularly great but I think they capture a little of what makes the event special. 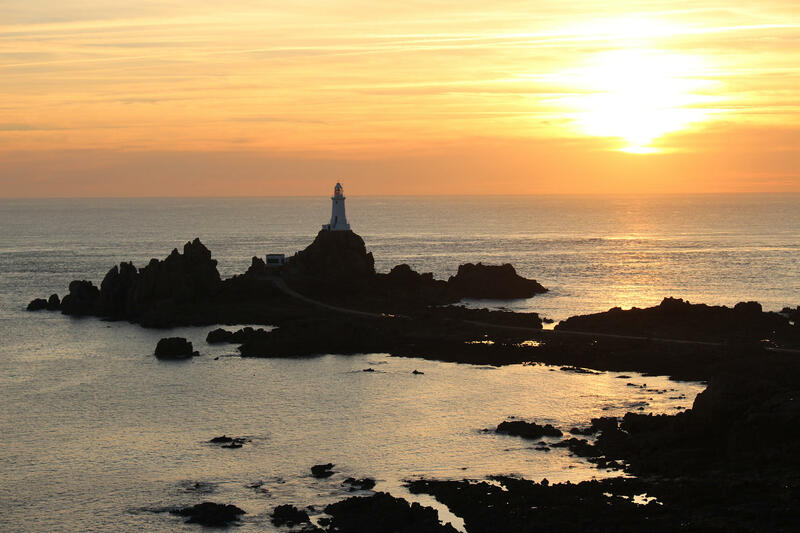 Through the 1970s and early 1980s I spent many happy holidays on the island of Jersey enjoying the beautiful beaches, stunning scenery and plentiful entertainment options. 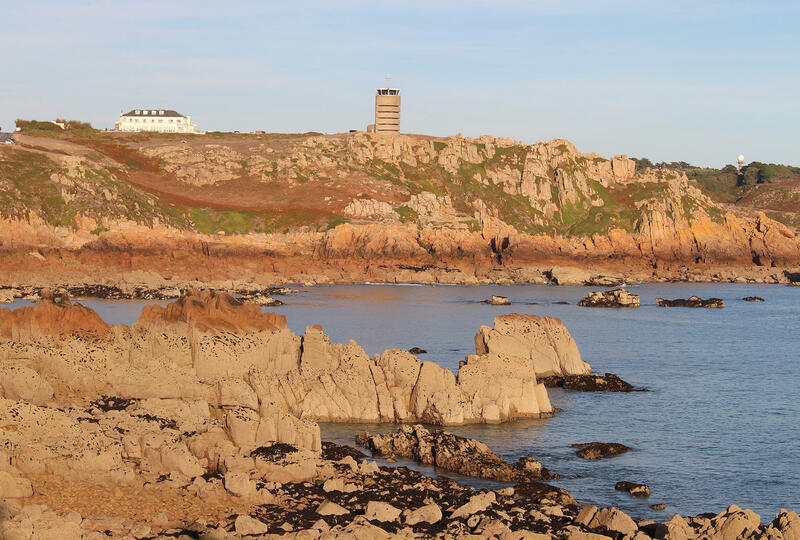 Jersey epitomized the perfect holiday island for all ages at a time when international travel by the masses was only beginning to make the very first in-roads to the domestic tourist market. 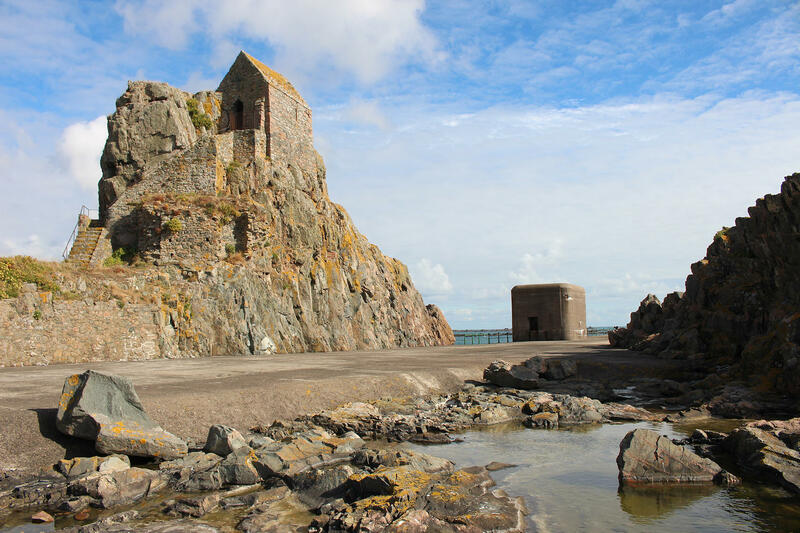 Many of my personal benchmarks were set here – when I think of a perfect beach it is Portelet that springs into my head and my mental image of the model castle is invariably Mont Orgueil. Visitor numbers have dropped by around 65% from the time of my childhood visits and the past 20 years have seen tourist capacity reduced by 50% to around 10,000 beds. A sure sign that the industry is not what it was can be seen in the downsizing of the once impressive tourist information office to a counter in the bus station. 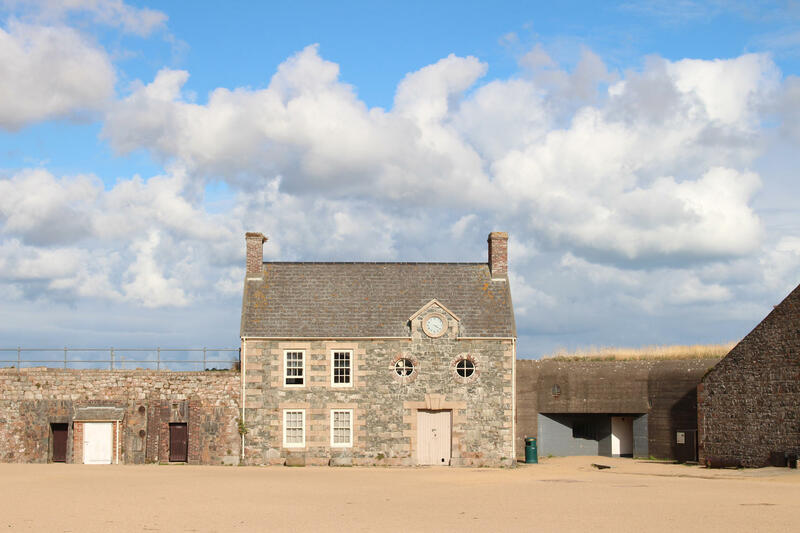 Today, the economy has shifted to a scarily high dependence on financial services and many of the tourist attractions of my childhood have been closed or demolished (such as the Shell Garden, the Battle of Flowers museum, the Fort Regent cable car and the Jersey Pottery). Most visitors today only stay for a four day break, rather than the one or two week holiday that was the norm through the 1970s and 80s. The demographic is quite different too – where once there was quite a mix of young couples, families and retired folk there is now much a heavier slant towards older visitors. 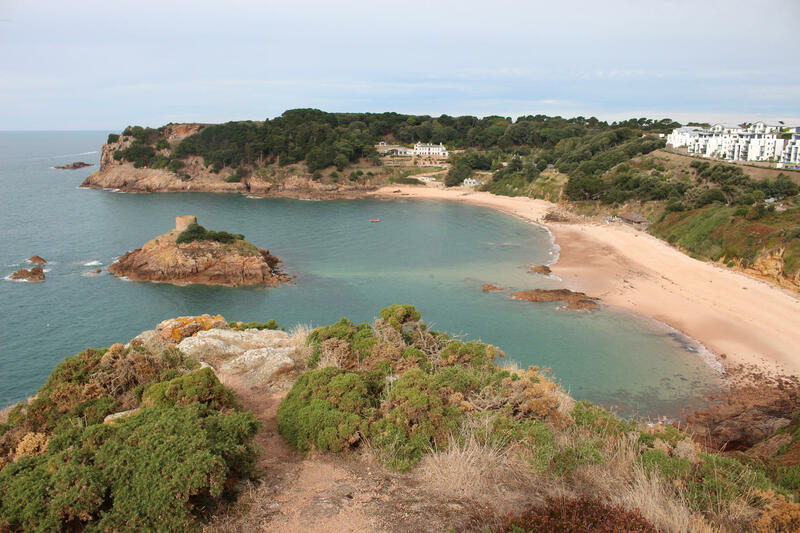 I was pleased to catch a glimpse of Ile au Guerdain in Portelet Bay on this trip and recall happy days swimming out to the island with my family. It looked largely as I remembered, albeit with one example of over–development on the clifftops that has interrupted the relatively unspoilt natural beauty of this stretch of coastline. 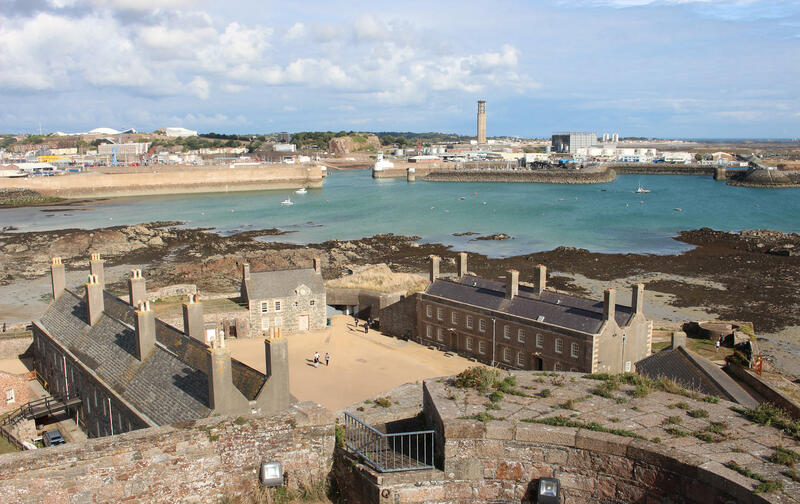 Most of the unsightly developments in Jersey have been confined to St Helier, which has been described as a necessary sacrifice to ensure that the rest of the island is spared. Even if this the case, I would hope that the idea of constructing office blocks triple the height of existing buildings doesn’t gain more traction. 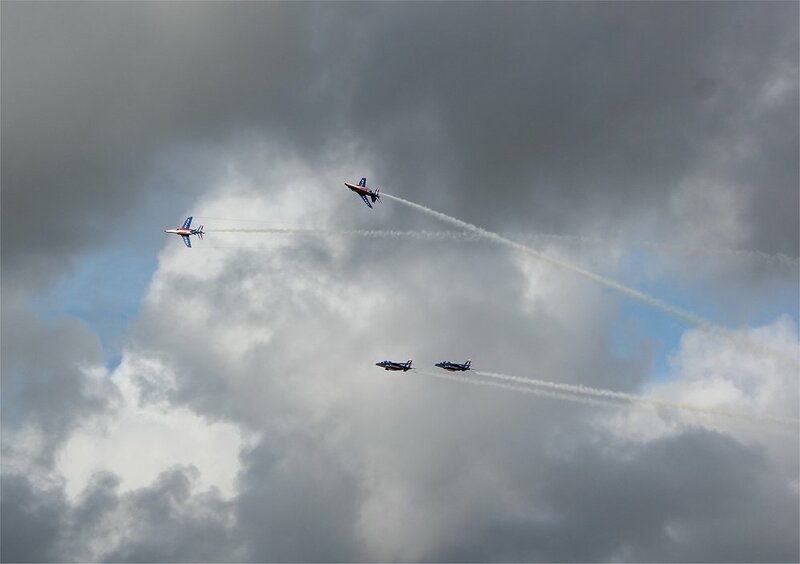 The good luck of the airshow this year was quite apparent as I pulled back the curtains in my hotel room to a ceiling of dark clouds and light rain. The morning turned out to be pretty mixed, but thankfully the wind was strong enough to push the short and sharp showers through fairly quickly. 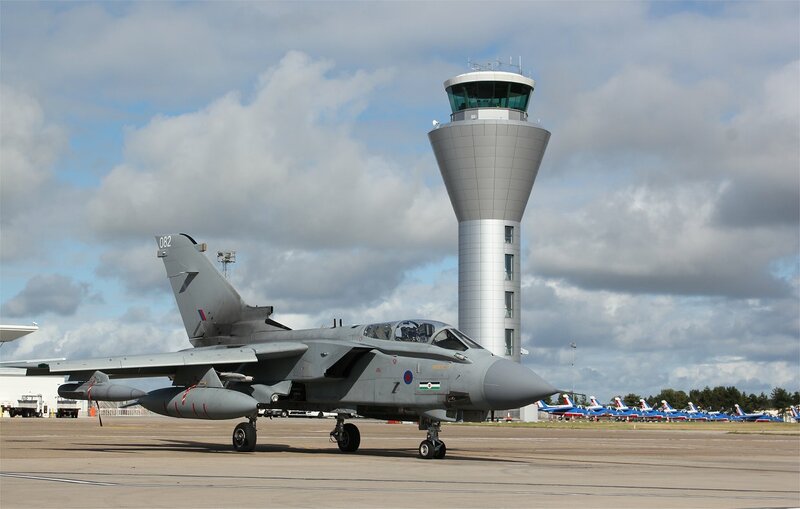 I had ended up at the airport to watch the morning’s departures which I knew would be something of a lucky dip. 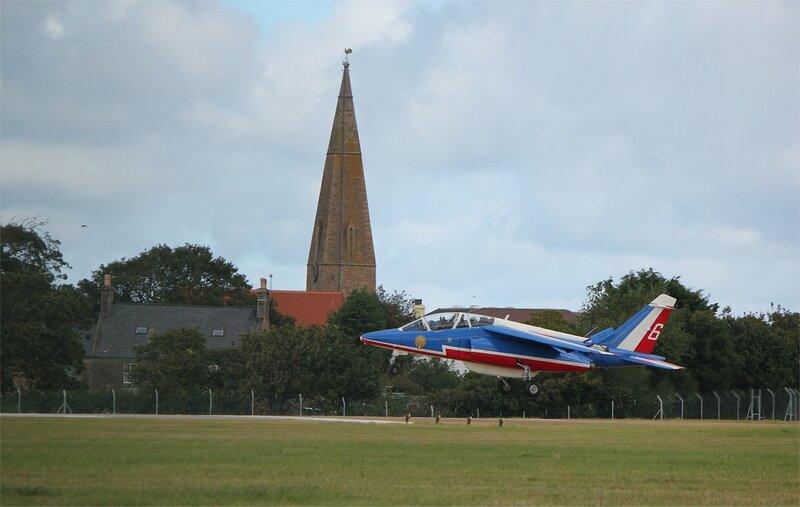 The alphajets of the Patrouille de France were some of the first attendees to leave. 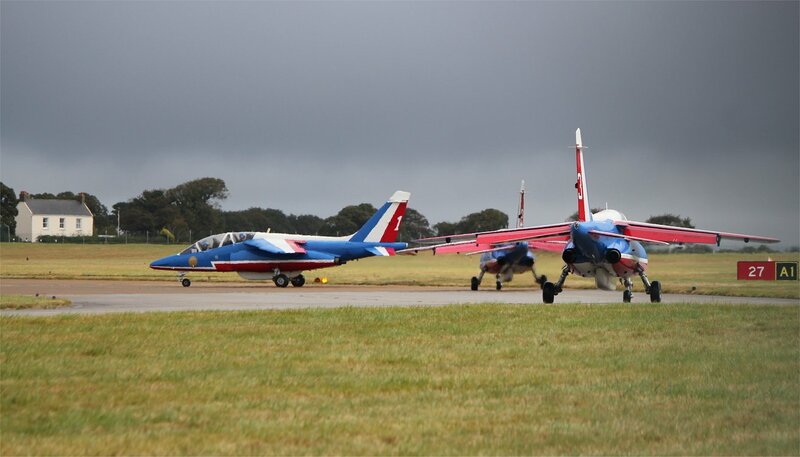 The first wave went out under cloudy skies with no sun to illuminate the jets on their passage down the runway – while the next two waves left to blue skies and sun! 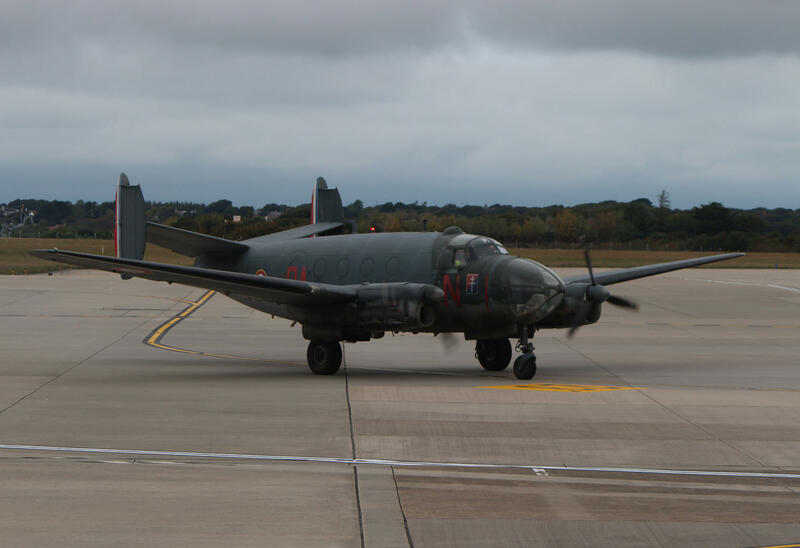 A little while after this the might bulk of French Air Force (Armée de l’air) Lockheed C-130 Hercules military transport 61-ZC rumbled down the taxiway and took off. 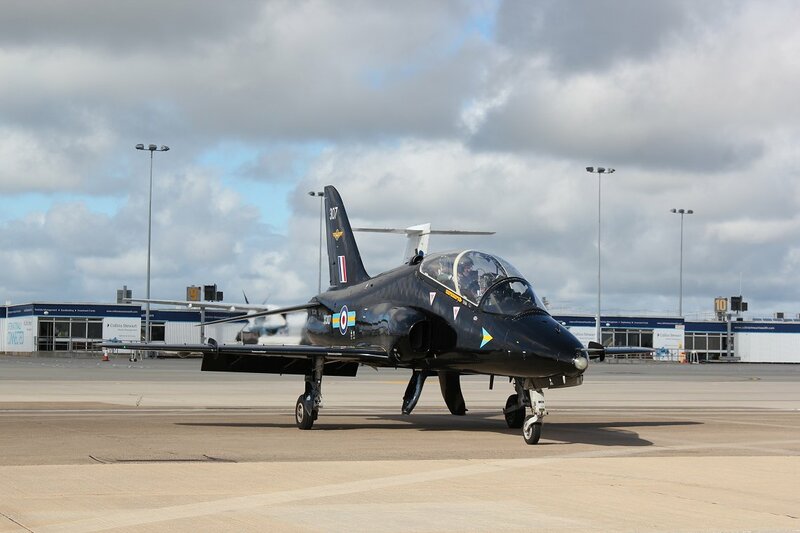 Finally, the morning was capped off by the departure of a trio of hawks, one in a black livery and the other two in a union jack design. 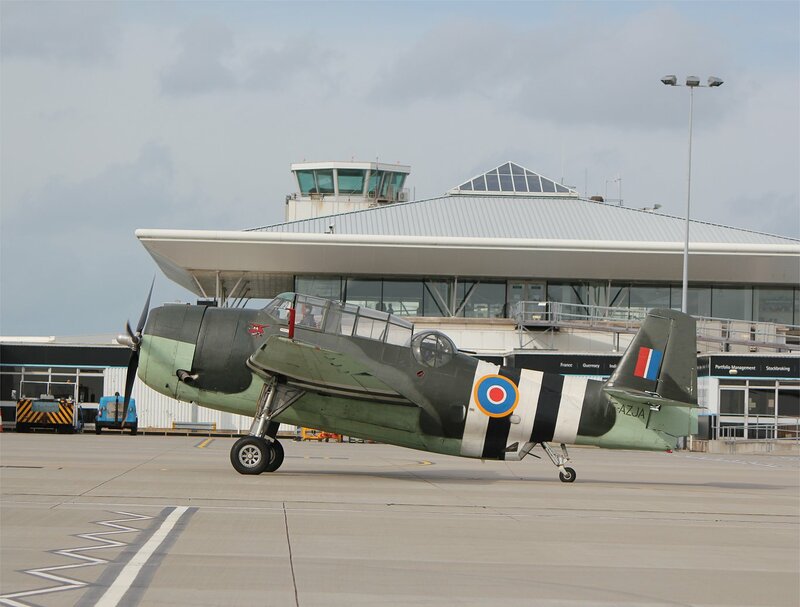 It seemed like an appropriate moment to leave – time to head back into St Helier for a bit of shopping and to visit the Maritime museum to check out their excellent exhibition TB Davis: The Only Sailor in the Fleet. My own departure was scheduled for the evening. After my experience with the fog last year I thought I would go for a stress free exit by ferry and indulge in a small spot of nostalgia. In some respects this was probably a mistake as the ferries these days are different beasts to those I travelled on as a child. In those days two Ro-Ro ferries made return crossings each day between Weymouth/Portsmouth and the Channel Islands, whereas now just one Ro-Ro ferry provides a single crossing in each direction. 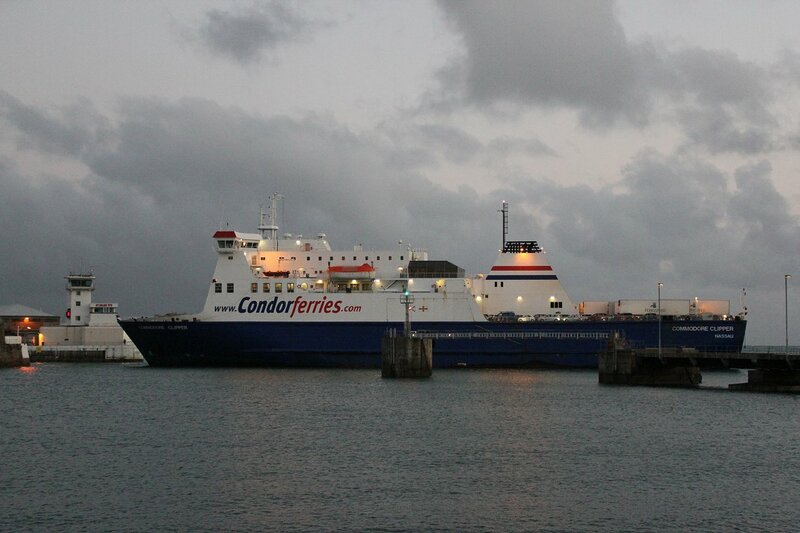 Fast ferries between Poole and the Channel Islands provide additional crossings. Nevertheless, it was interesting to see how much things have changed. 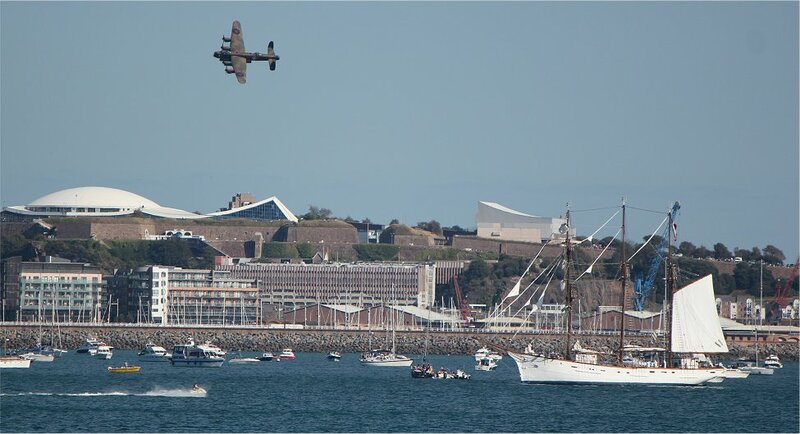 The arrival of a gigantic B-52 bomber overhead signalled the start of the 2012 air display in Jersey. 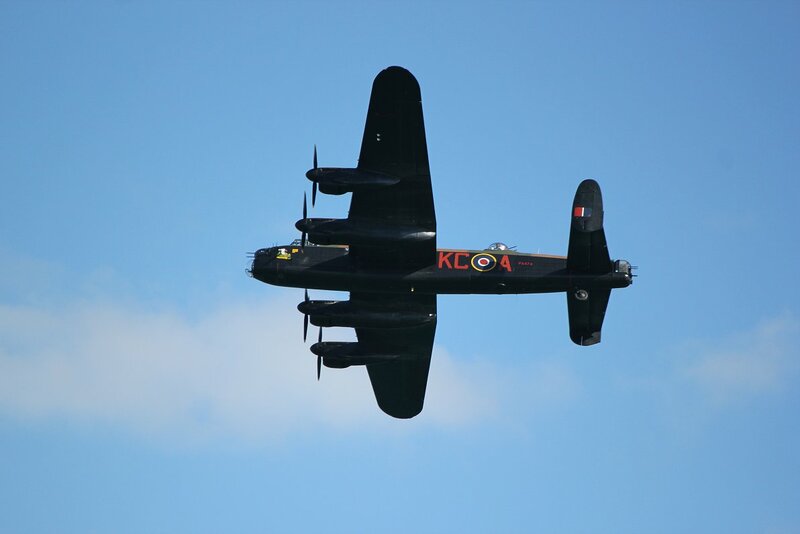 The conditions were as perfect as you could hope for at an air show with beautiful blue skies and plenty of sun. 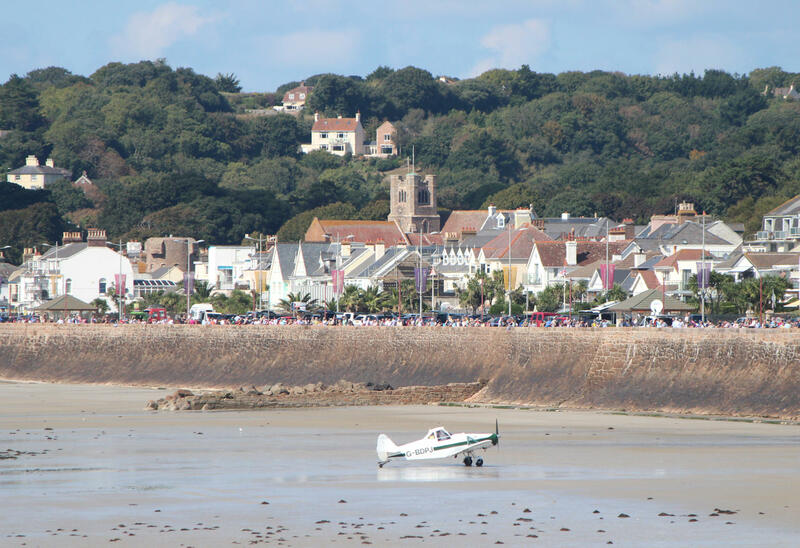 Already the sea wall was lined with spectators all the way round from St Helier to St Aubin. 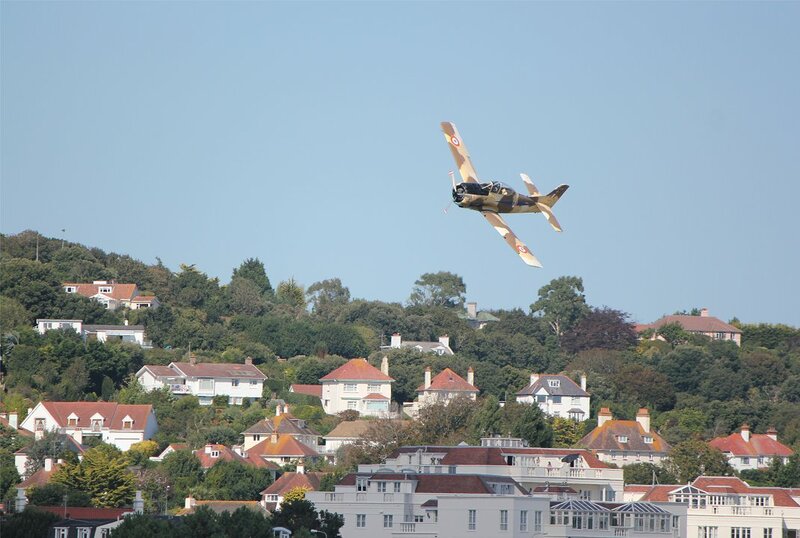 Once the B-52 had made one pass it returned for a second sweep of the bay though sadly it didn’t bomb the ugly luxury apartment blocks at Portelet or in the Waterfront development as some readers of the Jersey Evening Post had hoped! 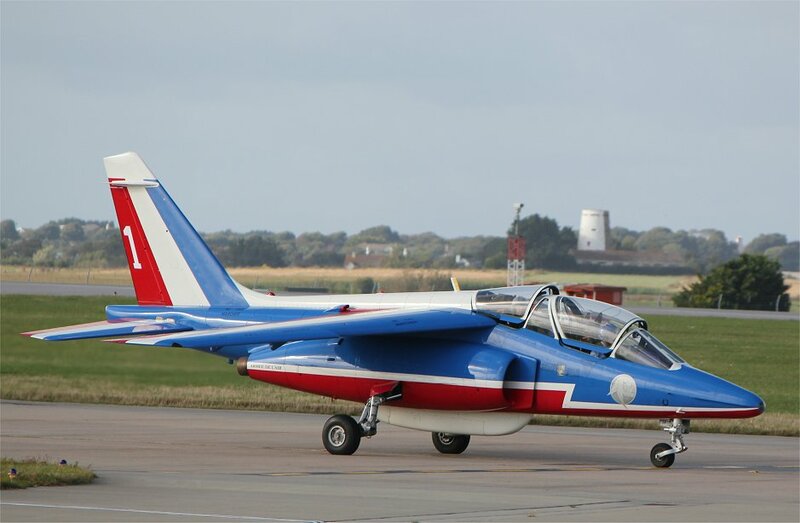 After the opening act we were treated to acrobatic performances from the Patrouille de France, Red Arrows and Groupe Tranchant who provided displays that had most of us marvelling at the skill of the pilots (particularly during synchro pair sequences). 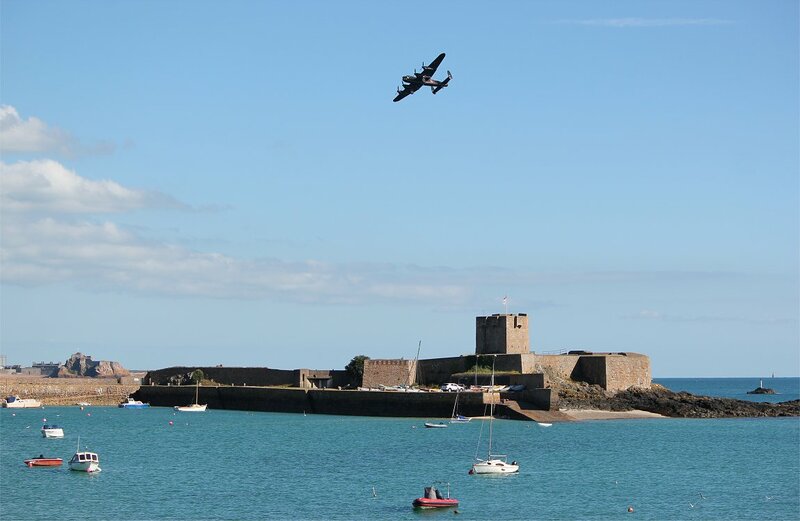 Alongside this we had the spectacle of many historic aircraft, though for me it was hard to beat the sight of a Lancaster as it followed the curve of the bay round to us at St Aubin. 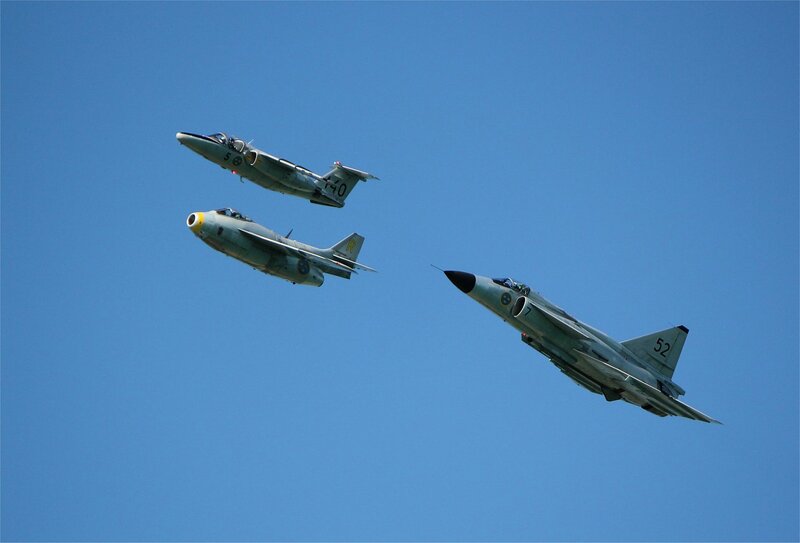 Amongst the more unusual of the guests at the airshow were three Saab jets from the Swedish Air Force Historic Flight which seemed appropriate in the 75th year since the founding of Saab. 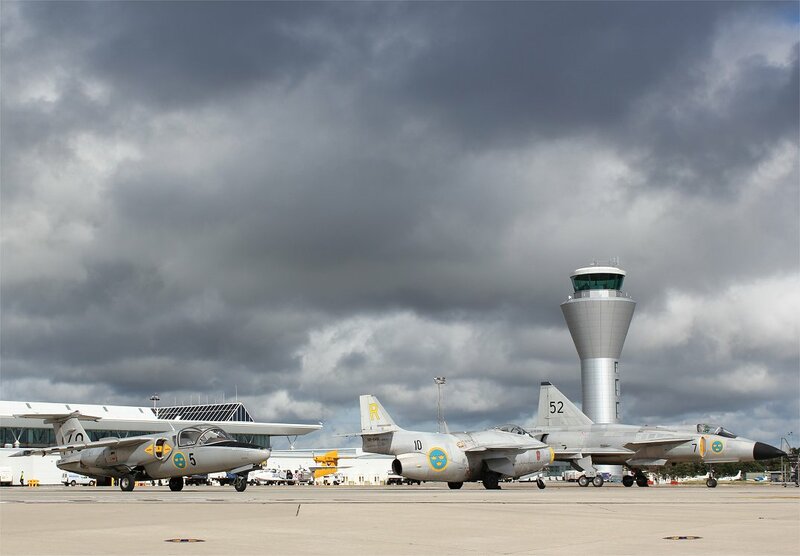 The three types on display today (the Saab J-37 Viggen, Saab J-29 Tunnan and Saab Sk60) date back to the 1950s/60s and have very distinctive designs. 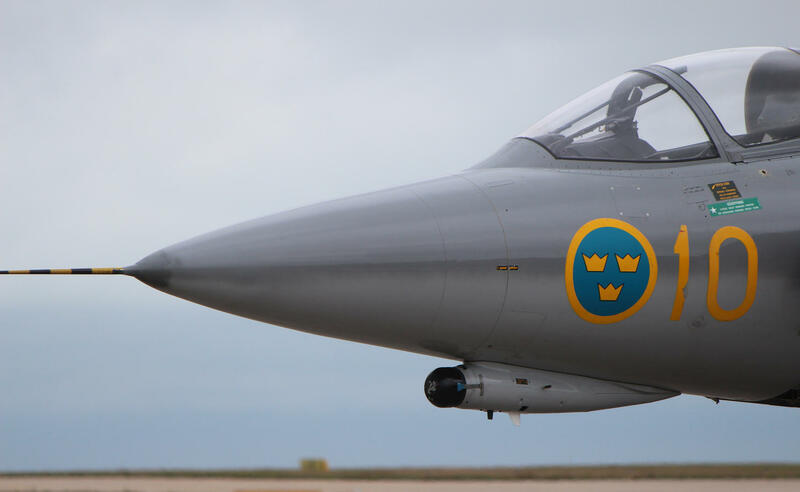 The Viggen in particular is striking for its use of two delta wings and its raw power made it the highlight of the show for me. 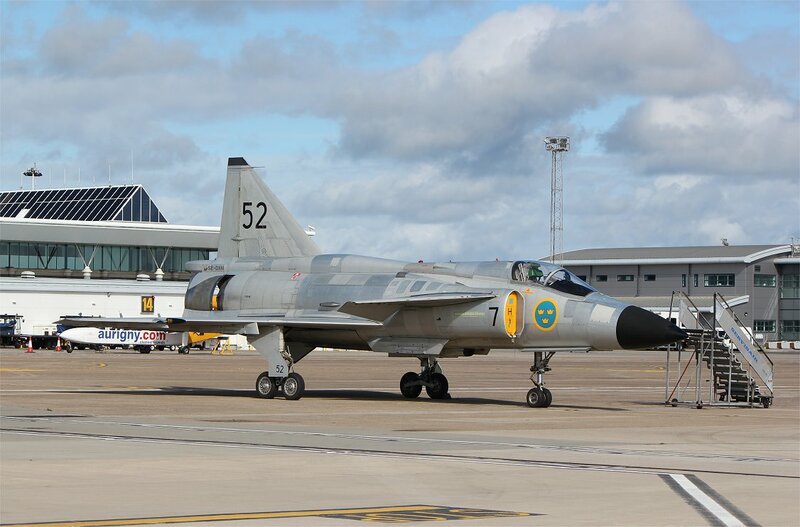 The Viggen was a relatively recent withdrawal from service – the type last saw frontline service in 2005 and continued on for a further two years in a training role before being completely replaced. 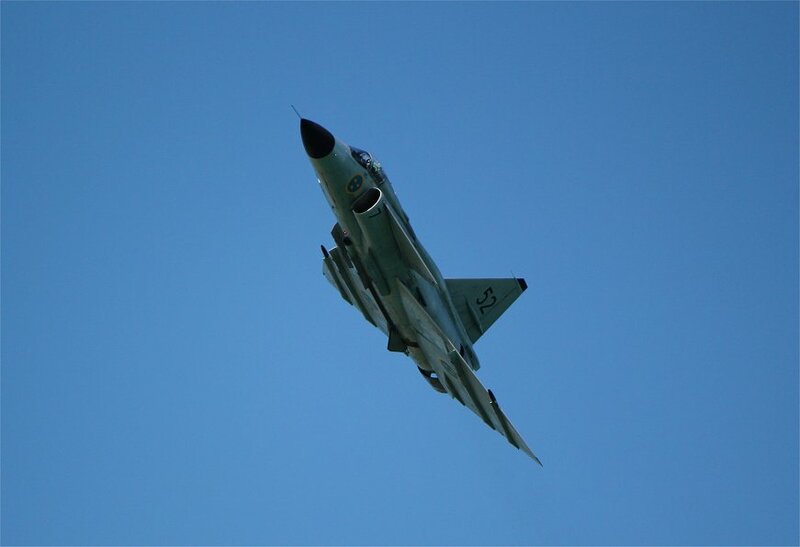 After this, five years passed without sight of a Viggen in the skies. 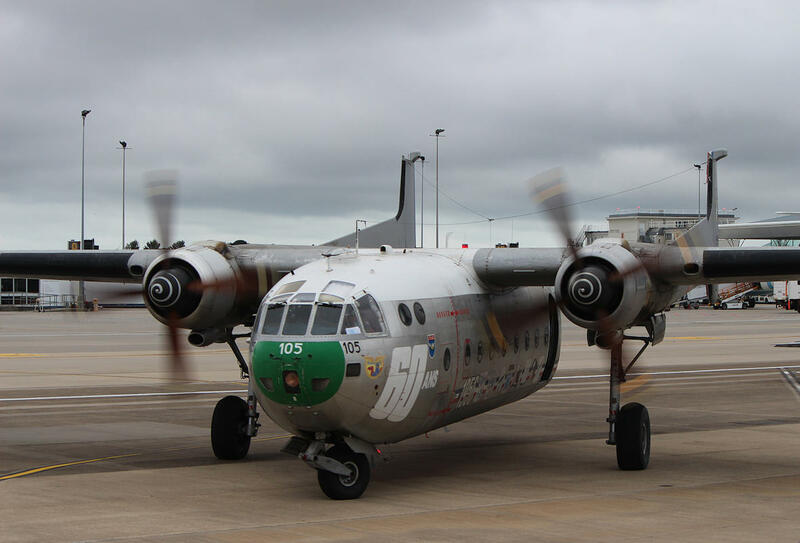 The restoration of one example to flight worthiness in May 2012 for the 75th anniversary and beyond has given all of us another chance to marvel at a remarkable machine. 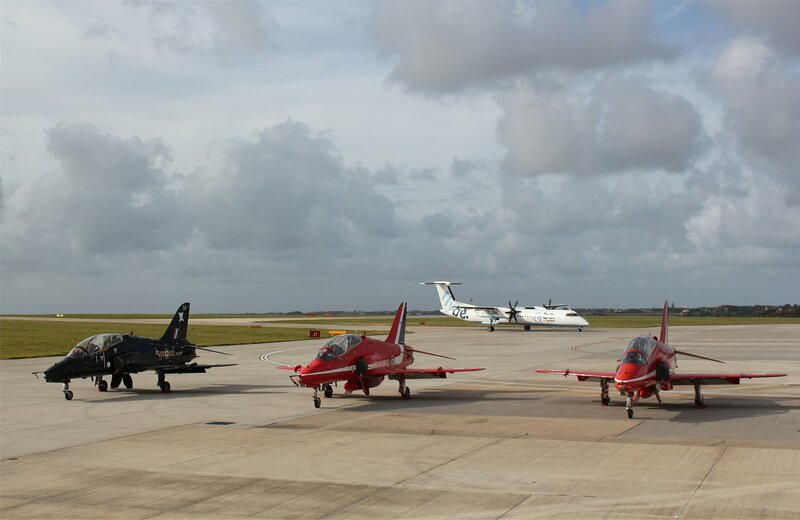 It was marvellous to see all three jets fly past in unison before their individual displays. 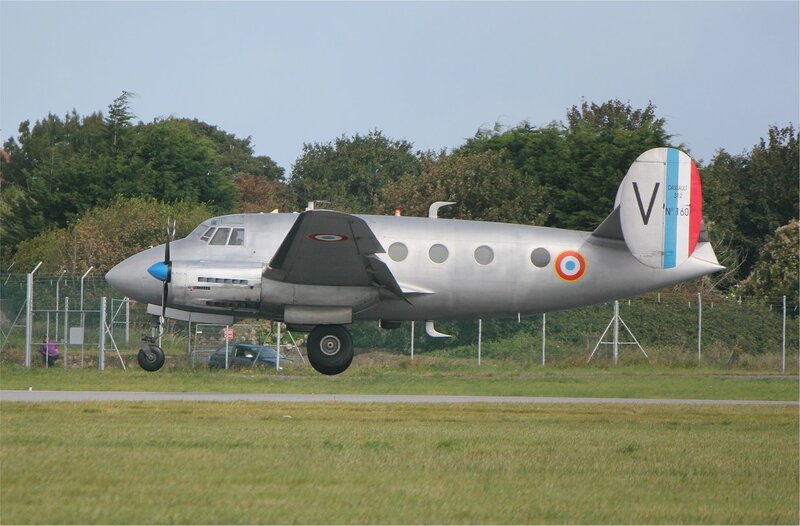 The airshow has a reputation for bringing in innovative display teams and that label certainly applied to the Brittany Shuttle (consisting of a Broussard mother ship and the electric powered Cri-Cri) which gave us the first launch of an aircraft from another aircraft whilst in flight since 1939. 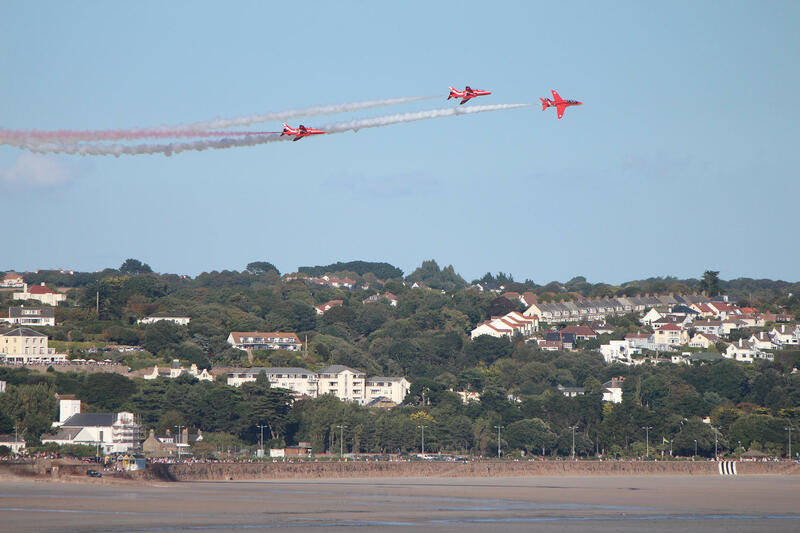 Apart from the ever changing mix of aircraft on display, the only noticeable alteration since my childhood has been the closure of the beach during the display for health and safety reasons. It now seems very strange to look back at pictures of the airshow taking place above packed beaches in the 1970s! 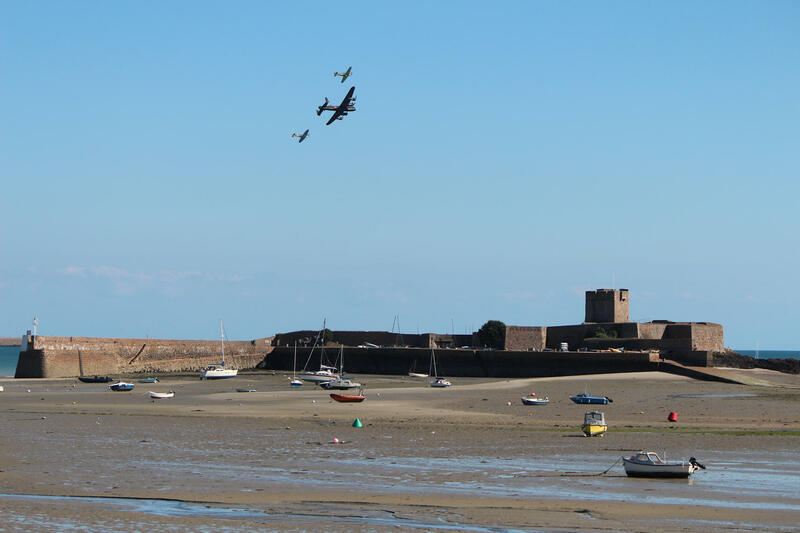 I had forgotten quite how marvellous the airshow in Jersey can be with the natural arena of St Aubin’s bay as a display space. Looking at the appreciation from the crowds that had turned out you would have to say that the efforts put in by Mike Higgins and the team had really paid off. I know that I was certainly wowed by everything that I saw. I am sure I will be back before too long. 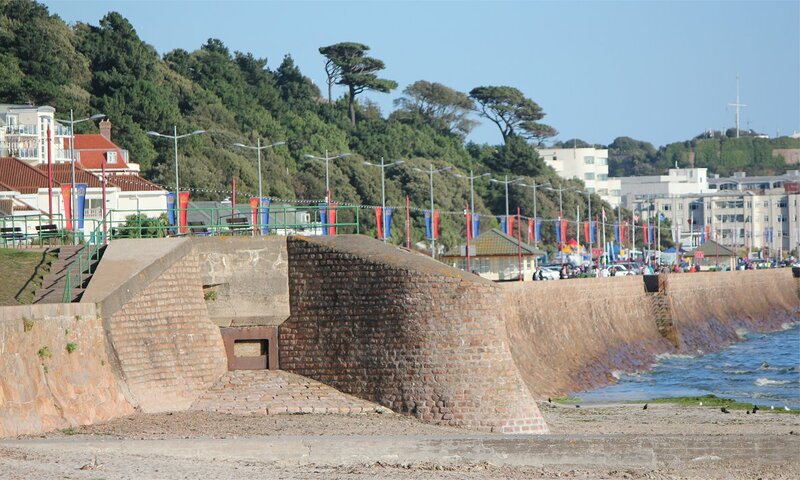 I spent many a day on the long stretch of beach in St Aubin’s bay as a child and was always fascinated by the strange constructions on the sea wall and one rather odd bit of wall seemingly standing in isolation on the beach. I am sure that I asked many questions that were impossible for my parents to answer at the time, so it was a pleasure to be able to walk the shoreline armed with a newish guidebook and answer my younger self! 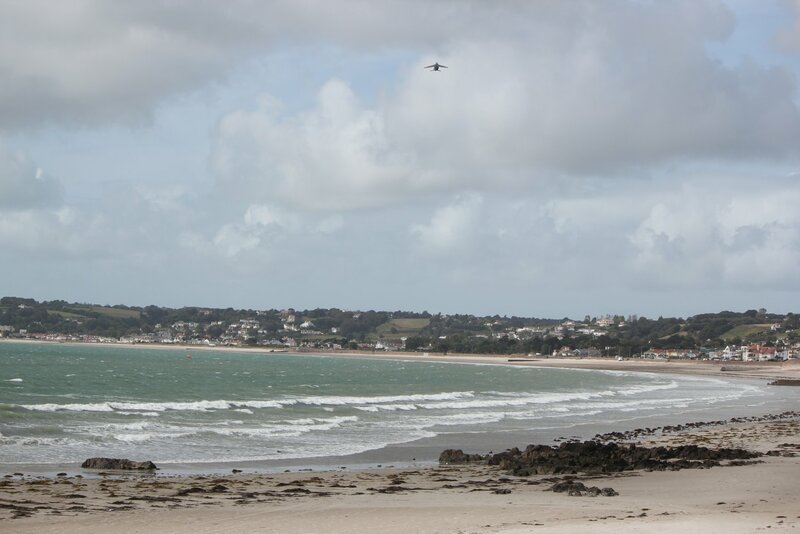 The source of wisdom for my walk was ‘A guide to the German shoreline defences of St Aubin’s Bay’ which was published by the Channel Island Occupation Society in 2010 (available to purchase from the tourist information centre). The guidebook takes you on a walk from Resistance Nest Richtfeuer (at the old bus garage) to Resistance Nest Aubin Hafen with explanations of everything that you see on the way. 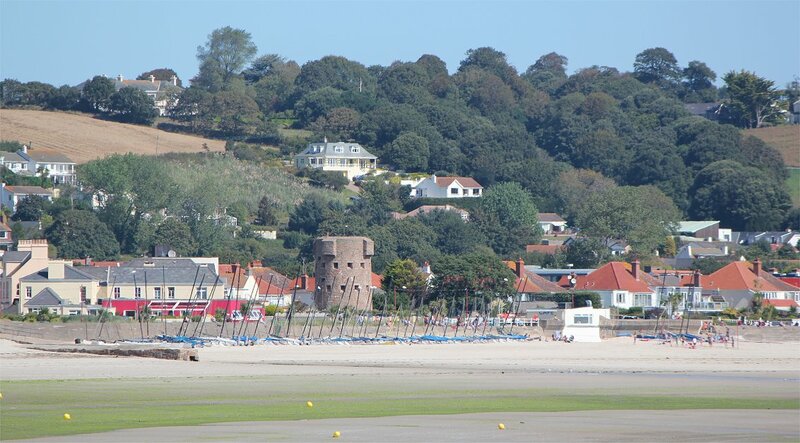 I spent about two hours taking a leisurely walk along the route, starting on the promenade but then moving down on to the beach for most of the way to St Aubin’s Fort. The tide was sufficiently far out that the causeway to Elizabeth Castle was completely uncovered and the view across the bay was very clear (in complete contrast to last year when it was barely visible through the fog). 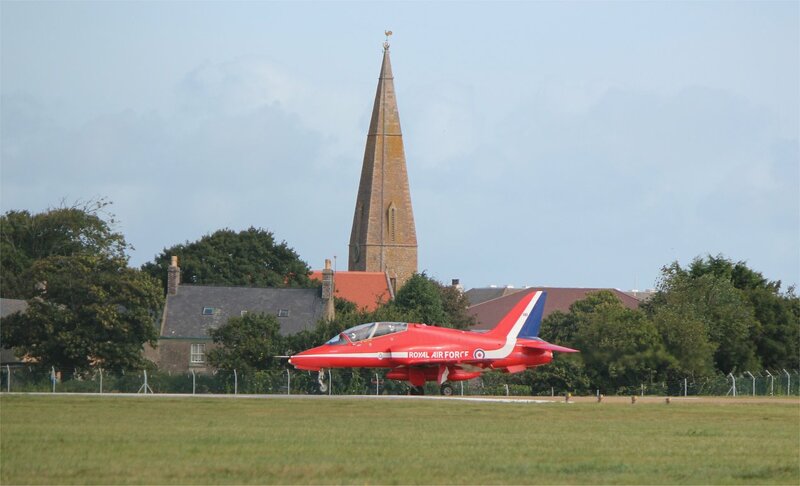 The blue skies and sun augured well for the coming airshow. 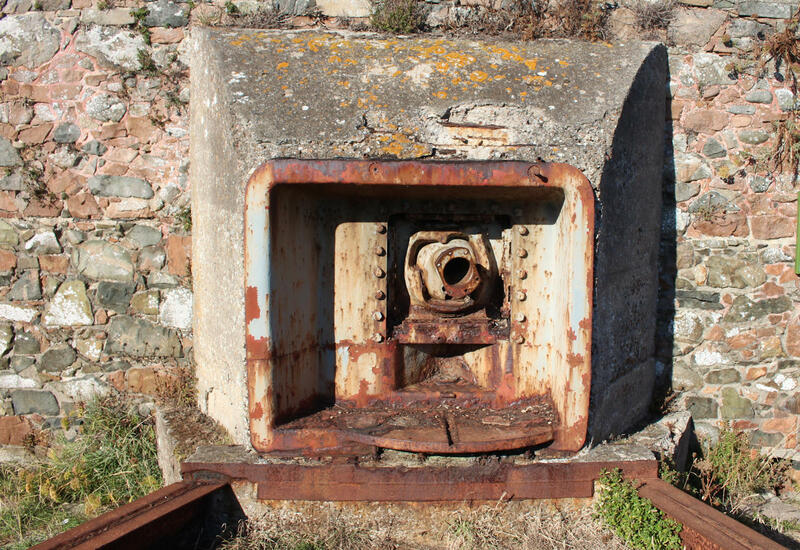 It transpired that the isolated stretch of wall I remembered at La Haule was in fact no innocent piece of sea wall, but part of a panzermauer (anti tank wall). 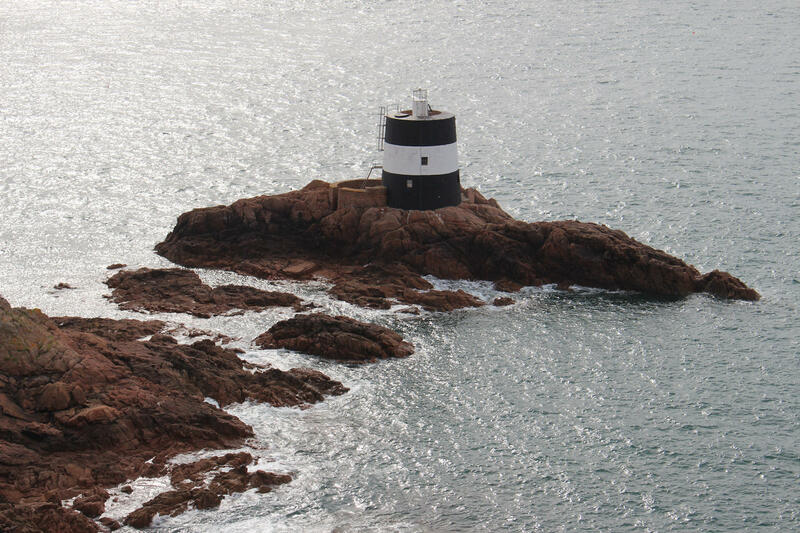 In 1992 the government in Jersey connected this up, though it is still easy to appreciate how odd it look standing on its own. 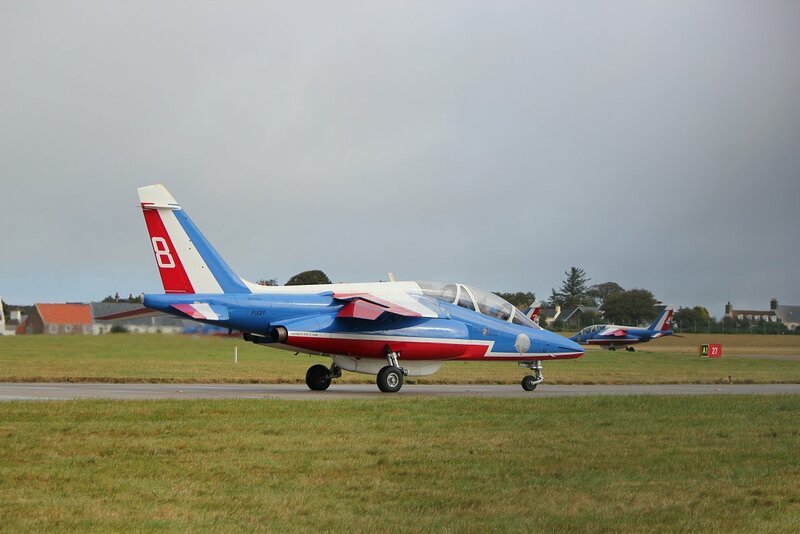 After an ill-fated trip to attend the Jersey international air display dissolved in the fog last year I thought I would give it another go this year. 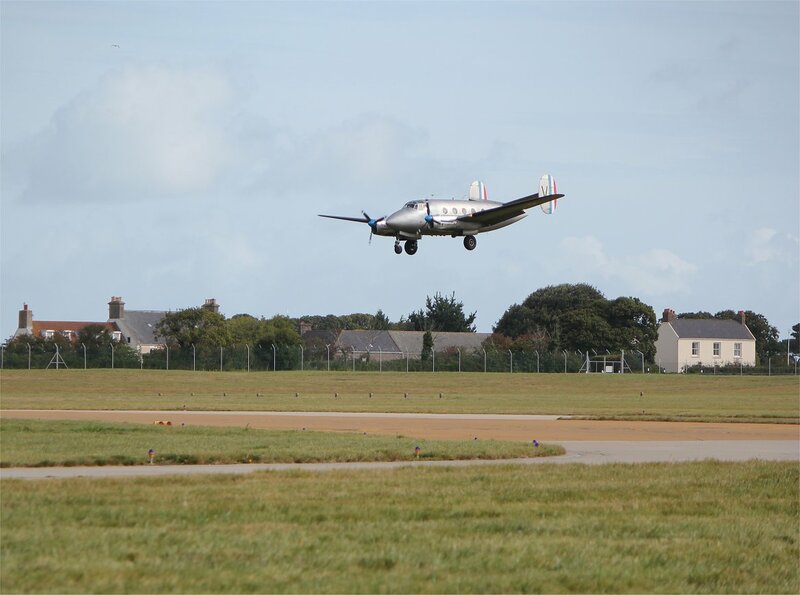 I hoped that the organisers couldn’t be so unlucky two years in a row, especially with it being the 60th anniversary of the airshow and the 75th anniversary of Jersey airport. 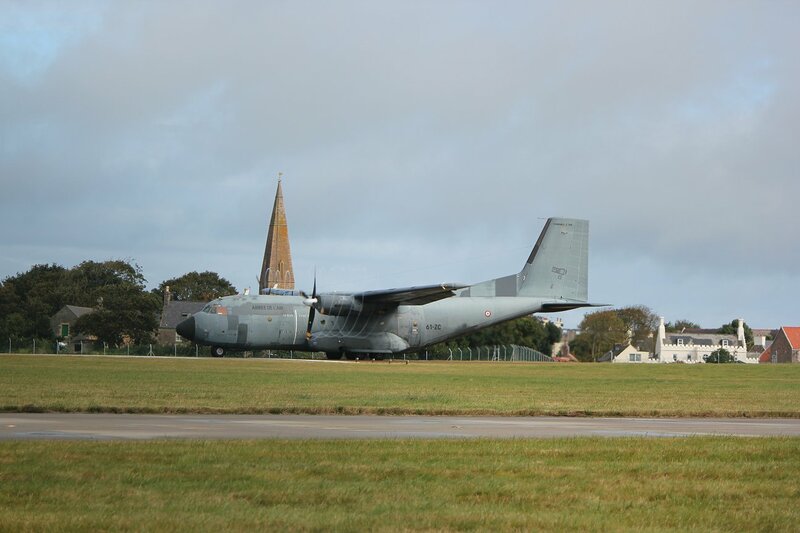 The weather in Jersey was decidely mixed when I arrived but steadily improved. 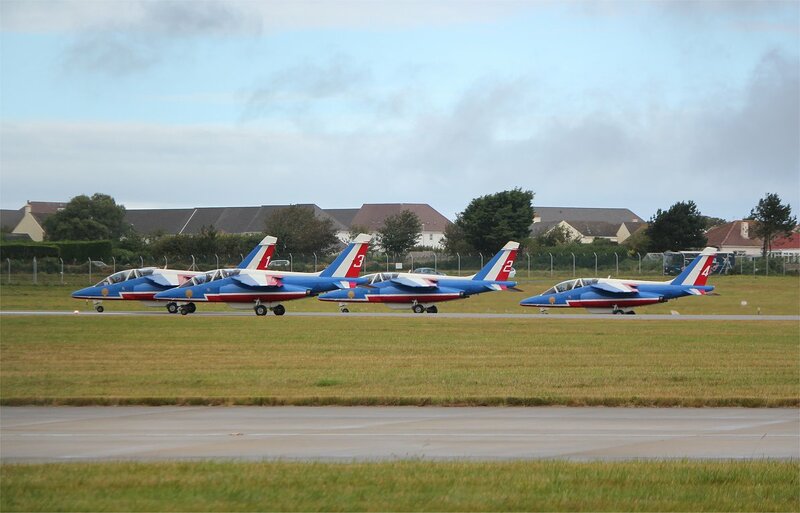 I was lucky enough to see the arrival of the Patrouille de France, the aerobatic demonstration team of the French Air Force (the equivalent to our Red Arrows). 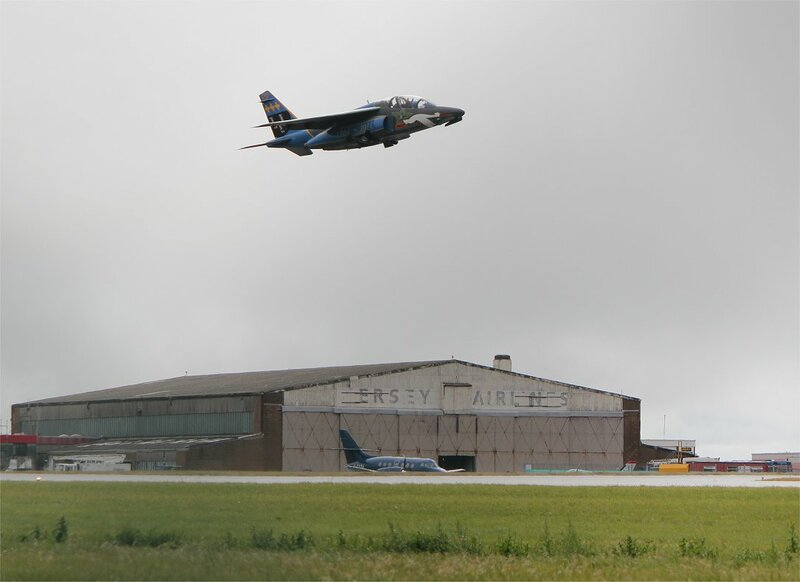 Initially three alphajets flew over the runway before peeling off one by one to land, followed a little later by the remainder. 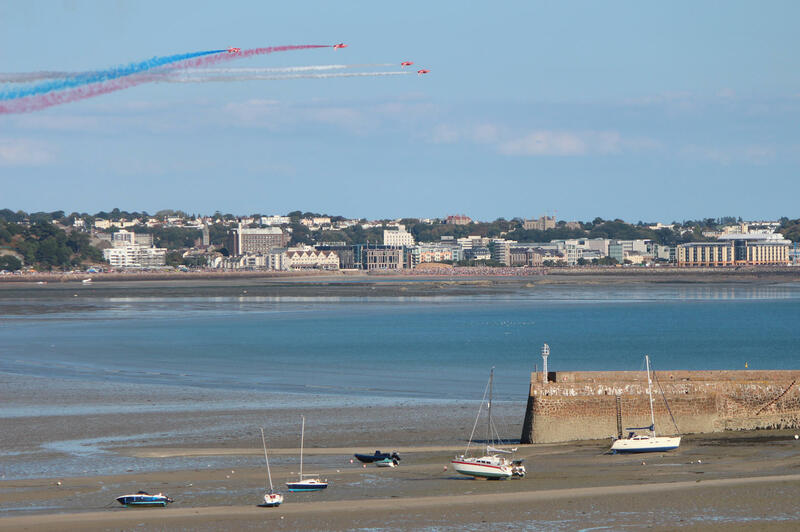 After watching this spectacle I headed in to St Helier to check into my hotel, returning later in the afternoon to view the superb static display on the apron at the airport. 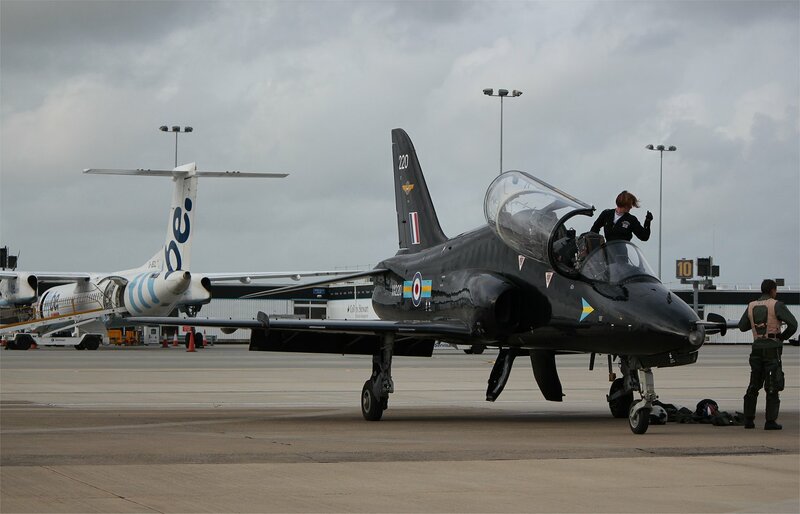 Static was something of a misnomer as some of the aircraft were still to arrive and others took the opportunity to get airborne for some pre-airshow practice. 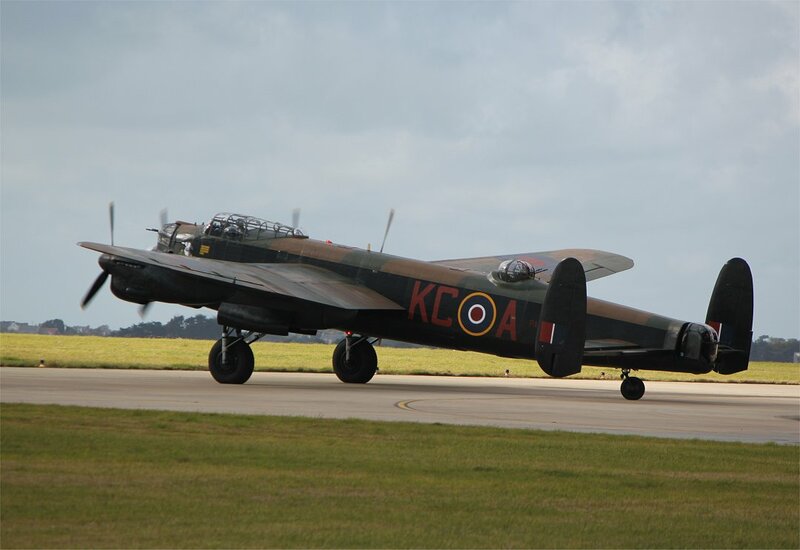 In the hour or two that I was there highlights included the Lancaster landing and the PAF returning to the air to practice their acrobatic routines. So, how did Jersey stack up to my childhood memories? Well, I guess to be honest that was always likely to be an impossible ask – if I’d gone back in time and visited the Jersey of my childhood as an adult it probably wouldn’t generate quite the same warm glow. In the build up to my trip to Jersey I expected that much would have changed. Nevertheless, the scale of the (over)development that I saw was absolutely shocking. Maybe I wouldn’t have felt the same if I’d visited every year and watched the changes happen incrementally, but the contrast between the island I left in 1985 and the one I revisited in 2011 was so much greater than even I had anticipated. The huge waterfront development feels like an out of proportion and ugly addition to the St Helier seafront, not helped by the dual carriageway isolating it from the town centre. It doesn’t strike me as a particularly people-friendly space either, which is a shame because it was always a pleasure to stroll along the esplanade (as it was) and out to the pier on our visits. 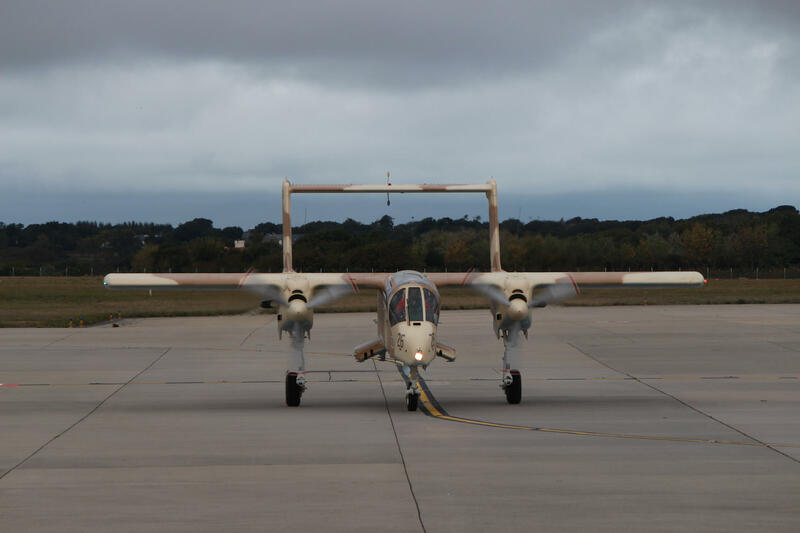 Portelet revealed – so now what do you think?) which seems a monstrous addition to the coastline. 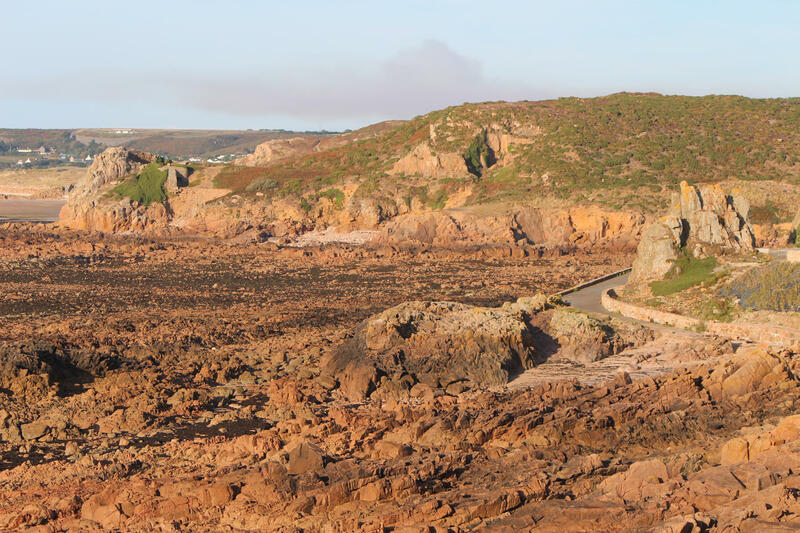 If this is the future for Jersey then I would say it’s a good time to go before the natural beauty of the place is swallowed up by luxury apartments! I didn’t travel around the island to see the main tourist attractions, so I can’t really comment on how much these have changed – that will have to wait for a future trip. 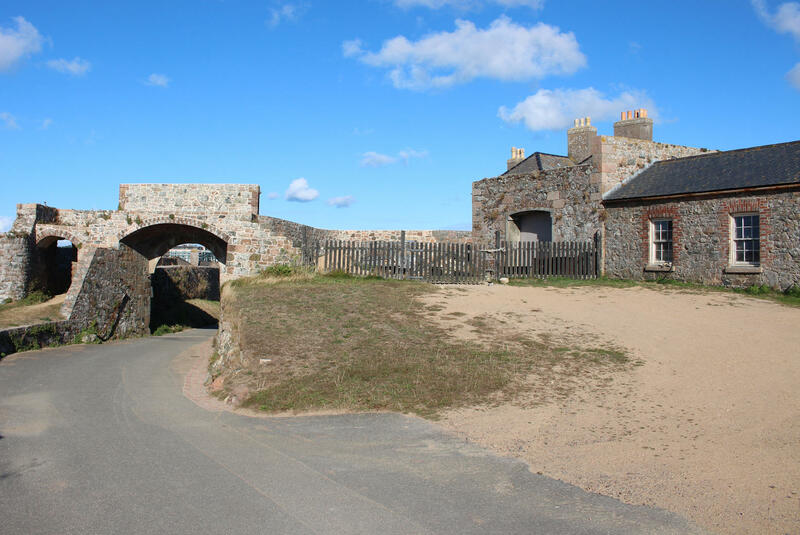 However, I did briefly visit Fort Regent which was always a highlight of my childhood holidays to Jersey. 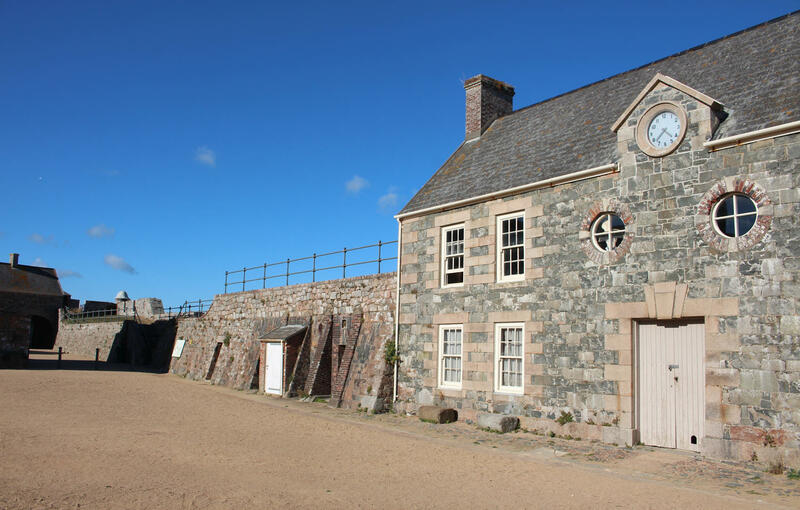 Fort Regent was constructed in the early years of the 19th century and sits in a prominent position above St Helier. In the 1970s it was converted into an entertainment complex and at the time we visited the island this was accessed by a cable car (see this wonderful youtube video – Fort Regent cable car capturing the experience) which both terrified and delighted me. In the late 70s/early 80s the attractions of the fort included a number of small museums, an aquarium, shell collection, an outdoor adventure playground, a giant snake slide, a hall of mirrors, a small theatre for shows, a swimming pool, extensive rampart walks and some historic stuff from the old fort. It always seemed to be an exciting mix – at least from a child’s perspective! Sadly, the cable car system has gone and there are no attractions to speak of in the fort itself – other than some limited leisure facilities and small businesses. The swimming pool was shut in 2003. To an outsider it feels like a missed opportunity. 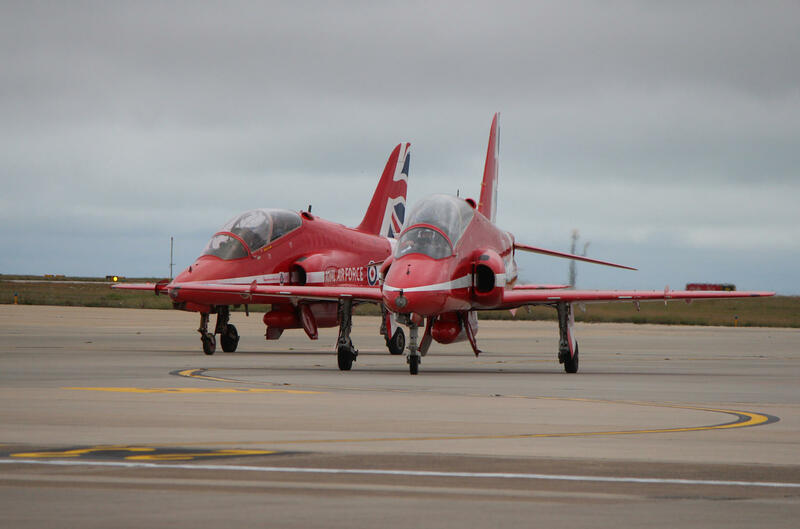 I had allowed myself to forget the hassles of fog delayed flights and the occasion where our ferry couldn’t dock in St Helier as the tide had gone out (frustratingly we sat outside the port for hours). The last day gave a rather unwelcome reminder of those hassles. So, all in all, so much for nostalgia! The grey skies and low cloud were still very much in evidence at first light but finally started to release their grip of the island by late morning. Up till now I hadn’t really appreciated the effect the weather had on commercial flights yesterday – the low cloud and fog had brought about severe disruption to commercial flights with 34 inbound flights and 27 outbound flights cancelled or delayed yesterday afternoon/evening. The disruption wasn’t over yet – I walked into the terminal to see that every flight out was either cancelled or delayed so far this morning. It was pure luck that my flight back to London Gatwick was later in the day, by which time conditions had improved significantly. 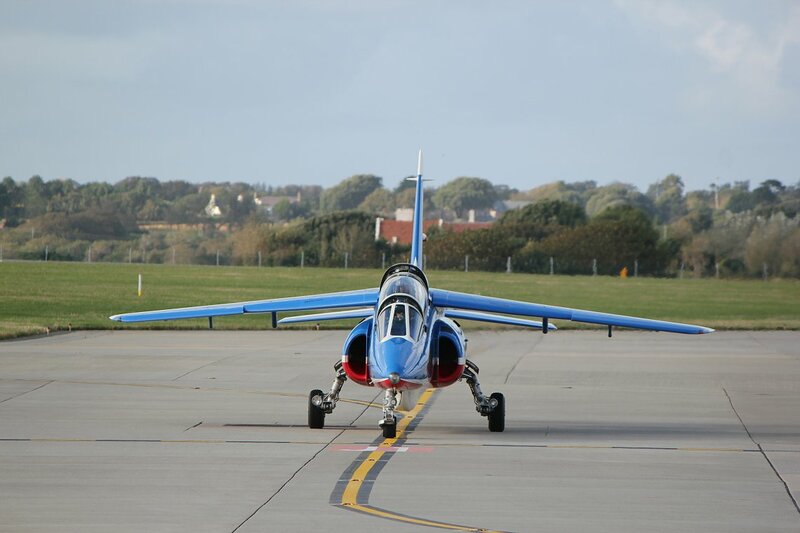 I took a walk around the airfield on the marked footpath/cycleway and enjoyed the spectacle of a few departures including those of the BAE Hawks, Alphajets and the Sea Vixen. 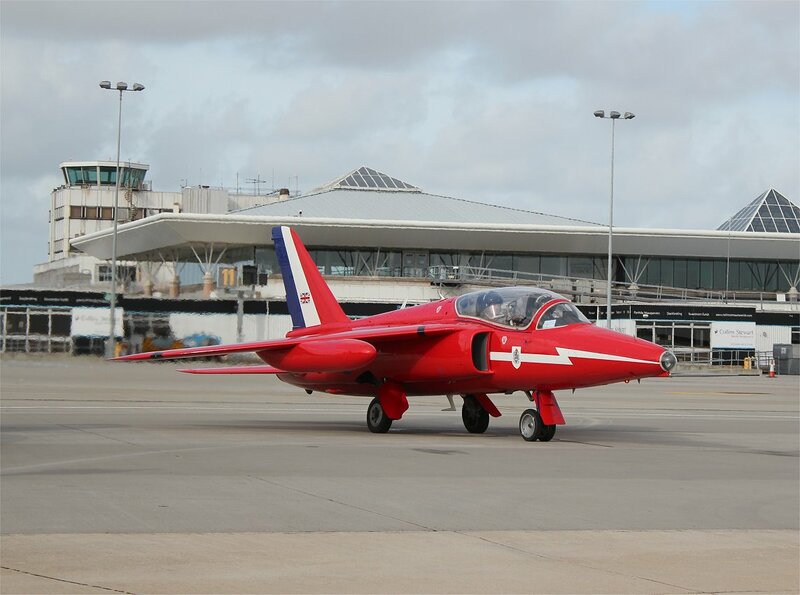 I particularly enjoyed the latter – there is something rather incredible about those jet fighters of the 1950s/60s that is hard to equal. 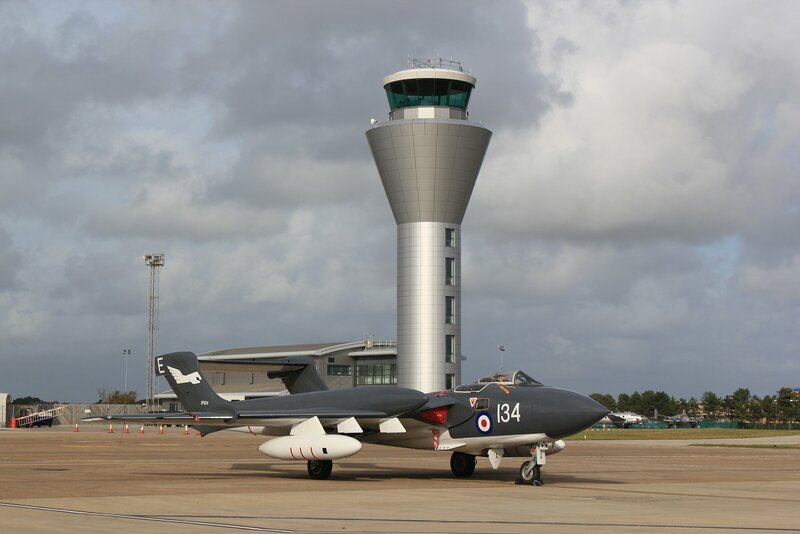 I was delighted to see (and hear) the Sea Vixen take off and then loop round for a pass before heading out to sea. 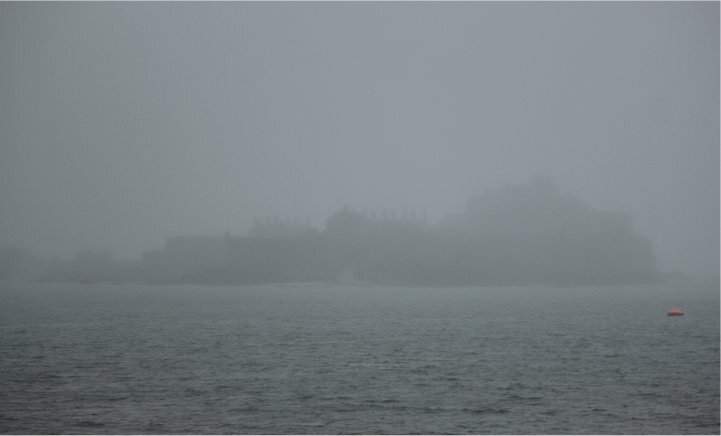 I took a photograph of Elizabeth Castle in the height of the gloom which amply demonstrates the impossibility of operating any kind of air display in those conditions. 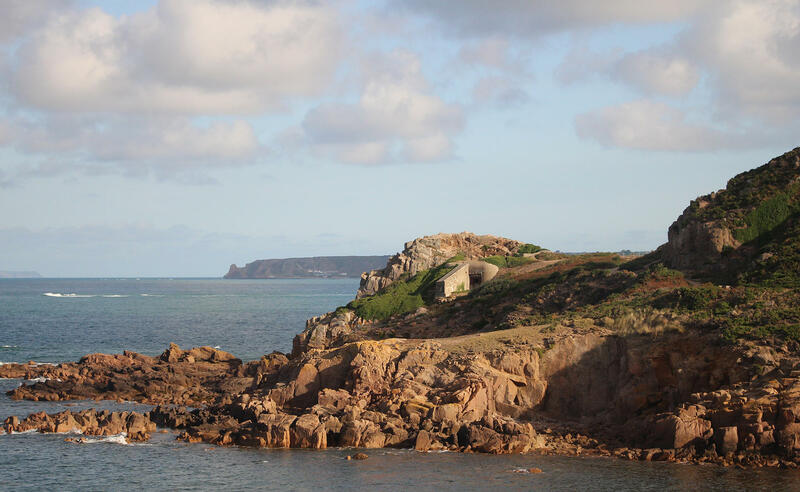 You could barely make out the castle and Noirmont was completely hidden from my viewpoint. 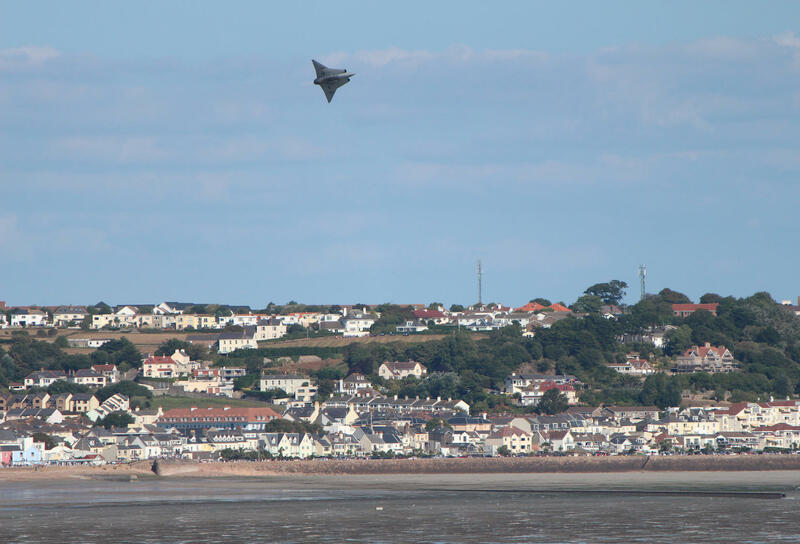 In contrast, a day earlier the conditions had been much better – as you can see from the second photograph which shows a distant view of the alphajet heading away from St Aubin’s Bay. 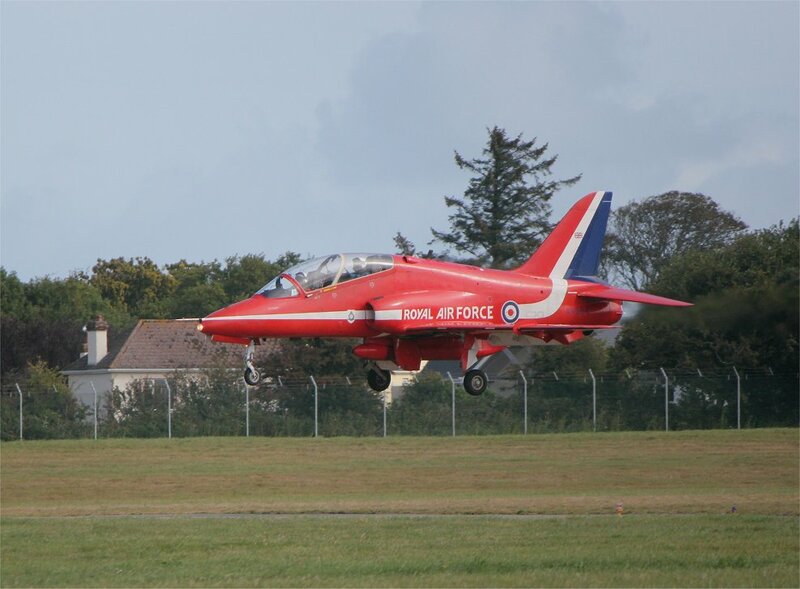 The curtains finally came down on the air show at 3.45pm and the local newspaper, the Jersey Evening Post, reported that it was believed to be the first time the air show had been cancelled due to poor weather. 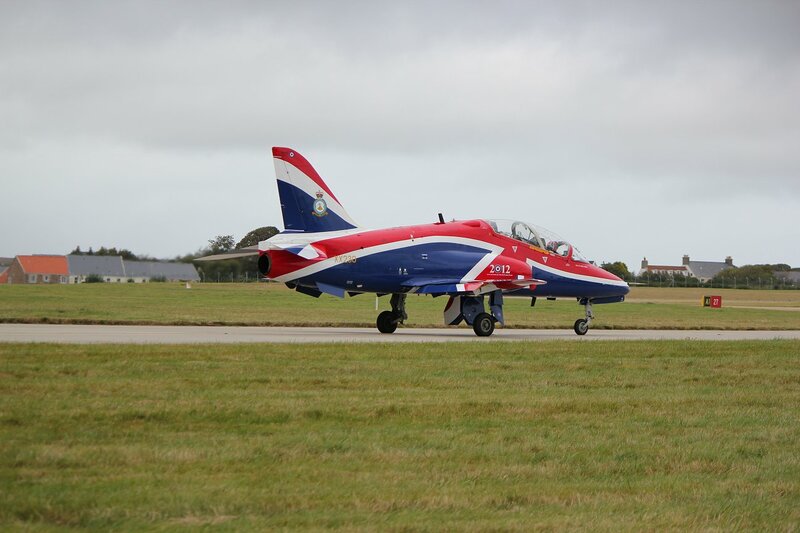 It’s got be a tough life as an organiser – having worked so hard to arrange the sponsorship for the air show, negotiate to bring such a wonderful array of aircraft in and then have the weather thwart your efforts (of course, still having to pay for all of that regardless of whether the show actually took place). 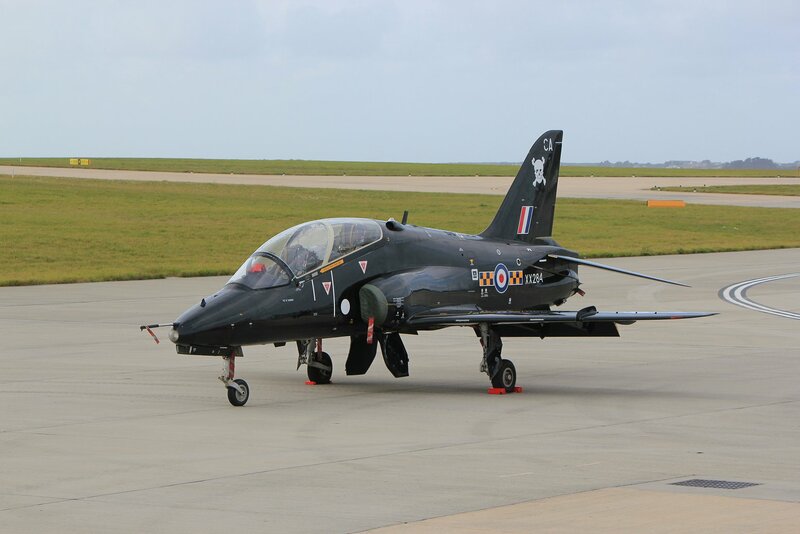 I hope they have better luck next year for their 60th anniversary air show. 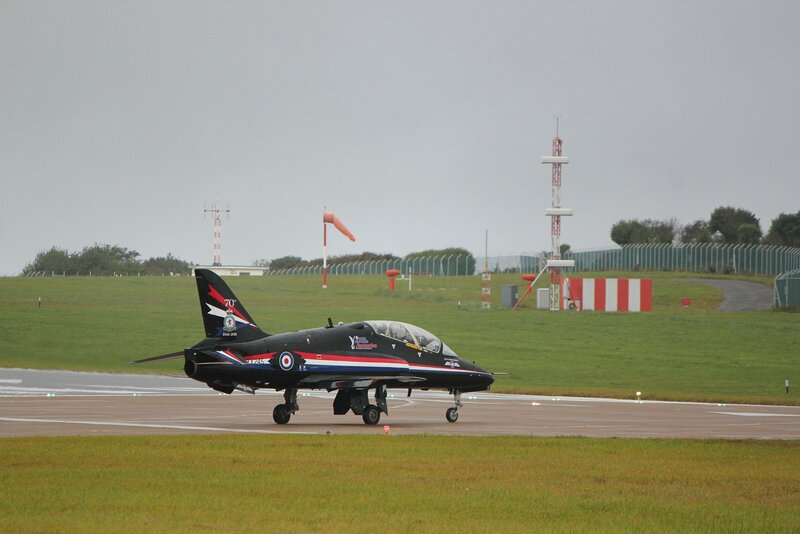 A static display of the aircraft taking part in the airshow opened at the airport this afternoon and I went to check it out, not having particularly high expectations. How wrong I could be! 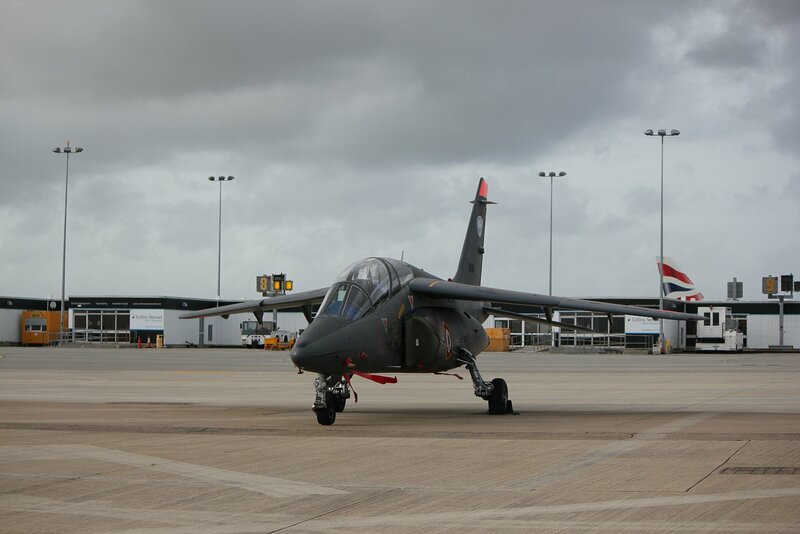 It was a fantastic opportunity to take photographs of the aircraft against the backdrop of the airport. 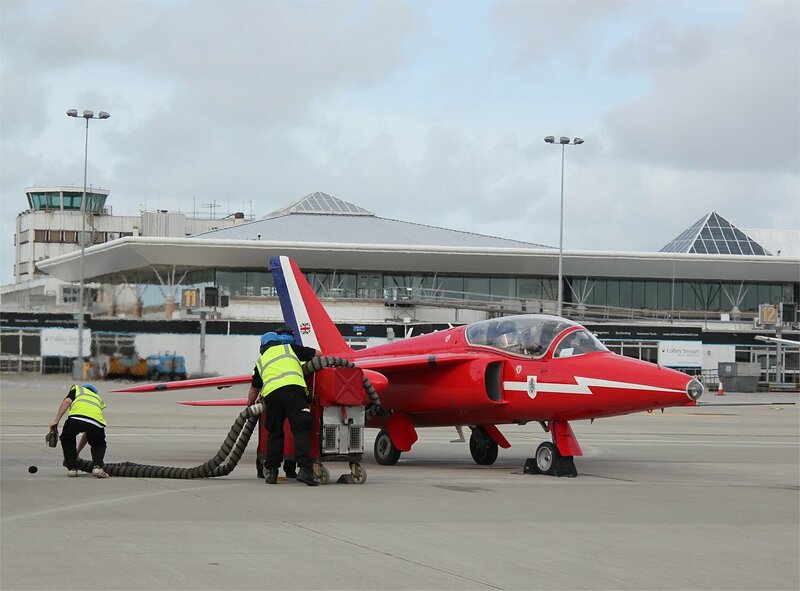 Indeed, static turned out to be a deceptive word as there were still some arrivals expected and many of the aircraft went out to practice, providing us with the spectacle of aircraft taxiing to and fro. All credit to the organisers for having arranged such a friendly and accessible display. It was well worth the small admission charge. An early start got me down to Gatwick airport in plenty of time for my 8.50am flight to Jersey with Flybe. It was only a short flight with around 35 minutes in the air but I was still very impressed with the fresh interior of the Embraer E-195 which made a welcome change from some of the tired plane interiors I have seen on my travels. 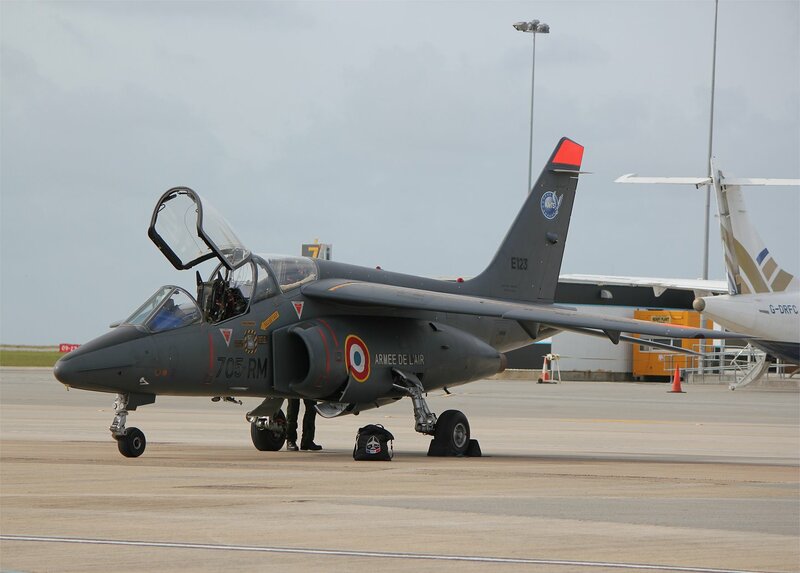 We landed a little early at about 9:44am, evidently followed a few minutes later by the Alpha Jets from the French Air Force which were waiting to cross the apron as I walked down the steps from the plane. 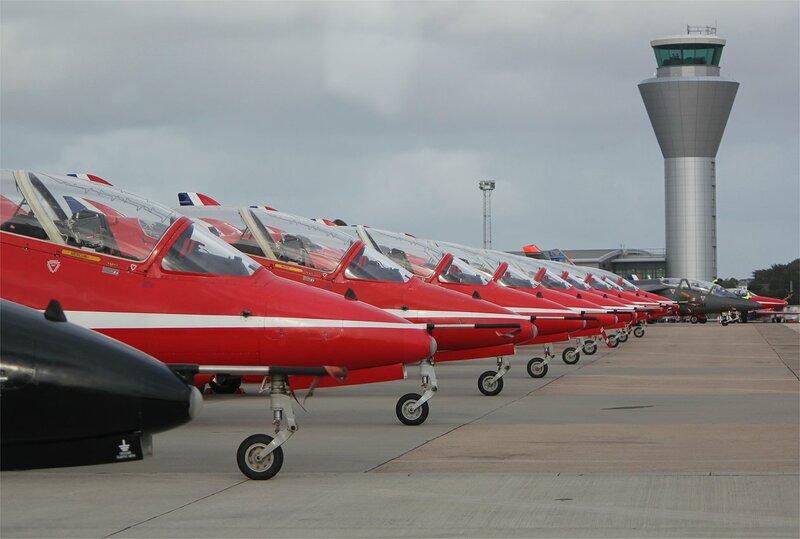 I made it out to the front of the building by 10am and a glance up at the arrivals board showed the Red Arrows were expected shortly. 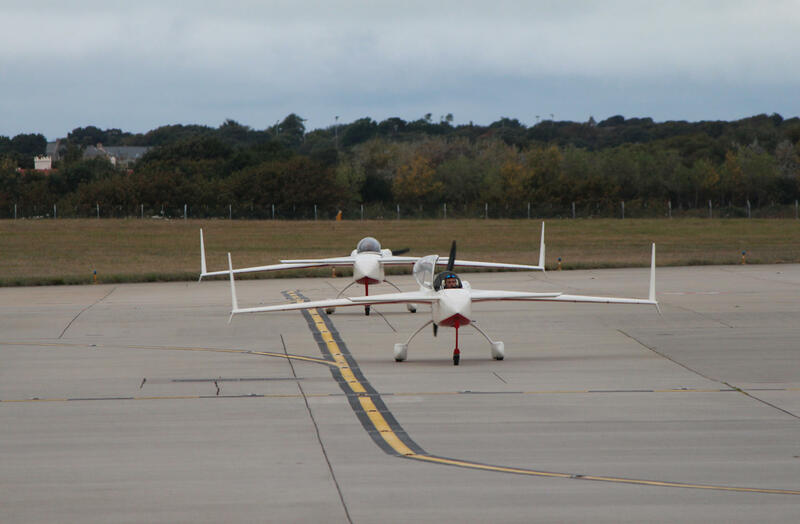 I made my way along the airport perimeter fence and joined a small crowd that had gathered by the Aero Club. 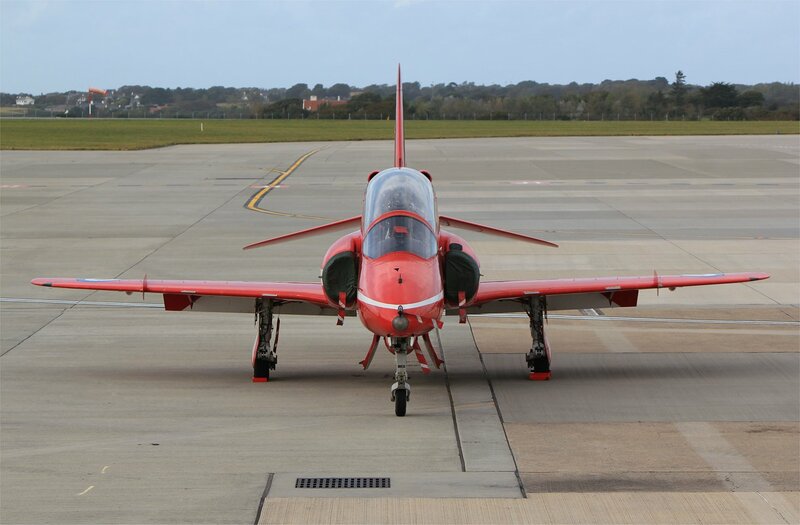 I didn’t have to wait too long before I saw the Red Arrows fly over the runway in formation and then peel off one by one, loop around and land. 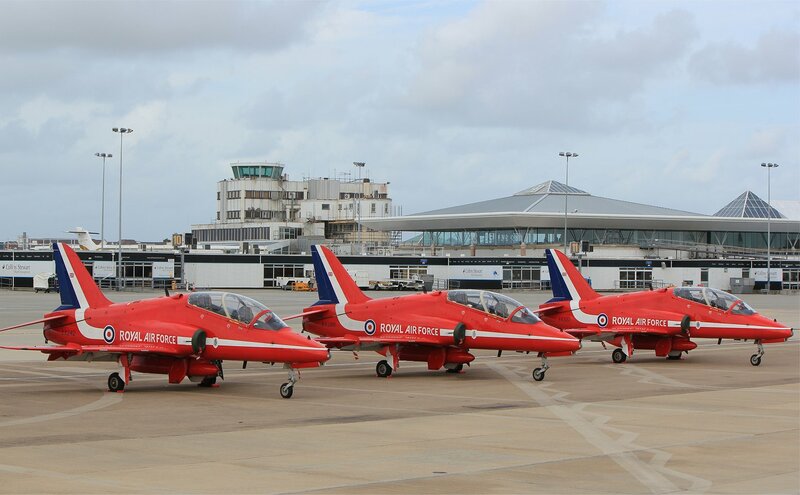 A magnificent sight and a great way to start the day in Jersey! 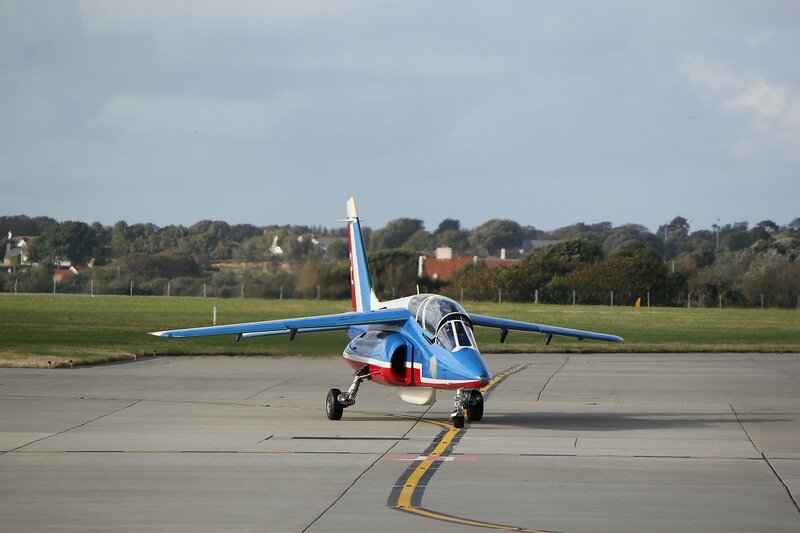 As well as the Red Arrows, I also saw the arrival of the RAF Shorts Tucanos and Dassault Flamants before heading off into St Helier with a smile on my face. 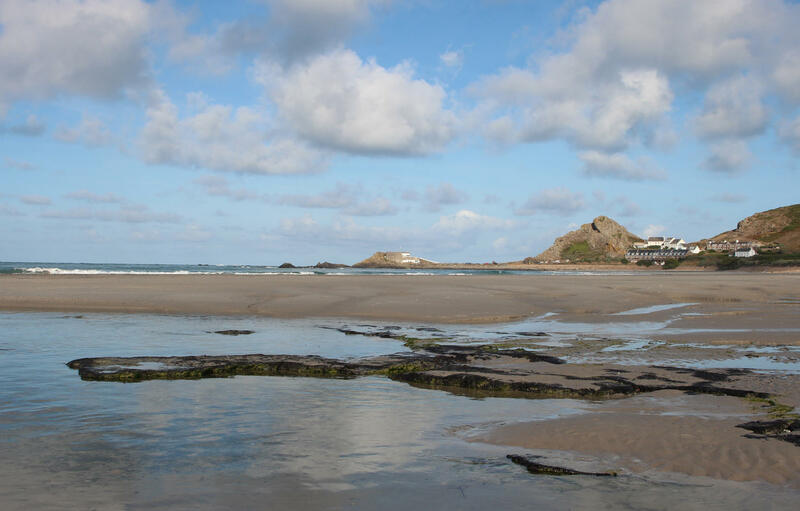 As a child I went on holiday with my family in Jersey for about nine summers in the 70s/80s (1973, 1975-1981, 1985) but I haven’t been back there for 26 years (unsurprisingly enough, by the end of 9 years I had an almost photographic memory of the interiors of the castles we visited each year!). 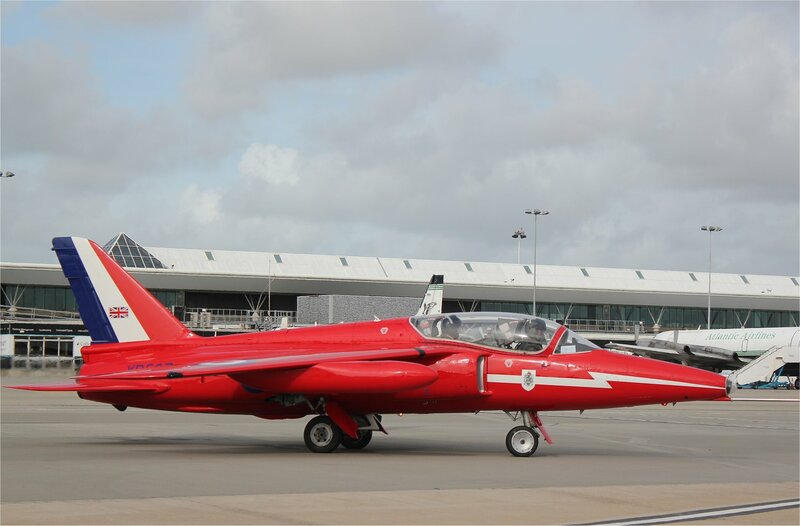 After idly talking about going back on a number of occasions I have finally got my act together and booked a flight out to go and see the Jersey International Air Display later this week. 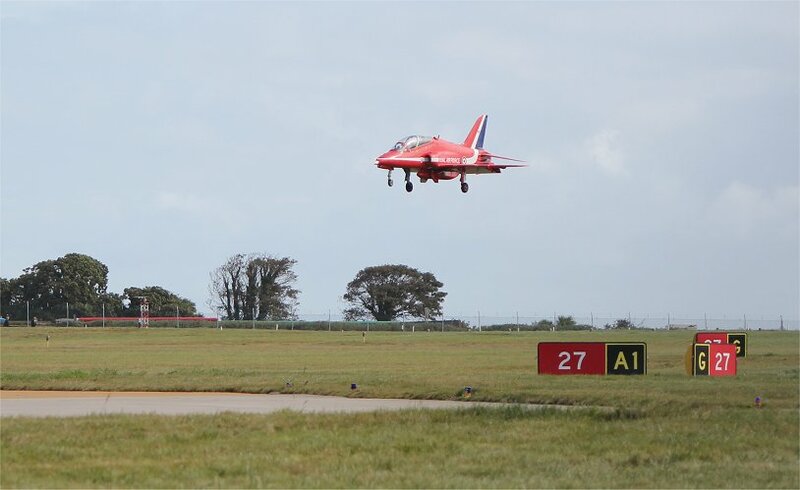 I’ve seen the air display before – possibly two or three times – though I would only have been four years old on the probable first occasion in 1976! 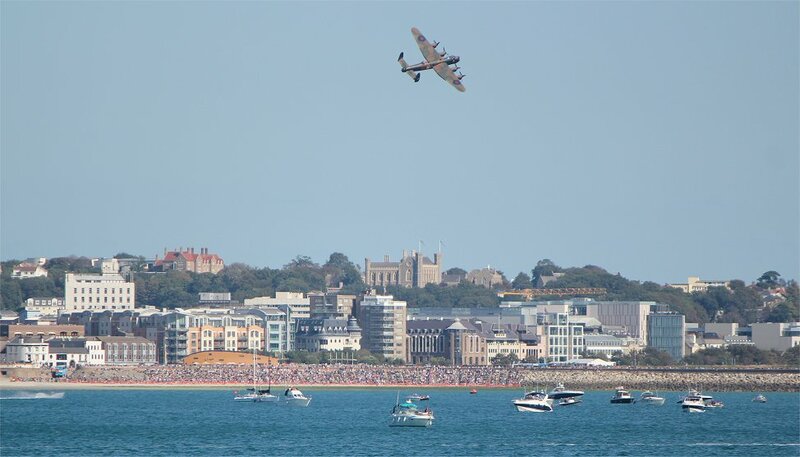 Whatever the exact year(s), I am told that amongst the planes presented to us over St Aubin’s bay we saw a Shackleton, Vulcan and Harrier. At that time health and safety was not such a concern, so you could happily sit on the beach and watch everything take place above you – the only concession to such matters being an instruction for bathers to get out of the swimming pool whilst the Harrier hovered! 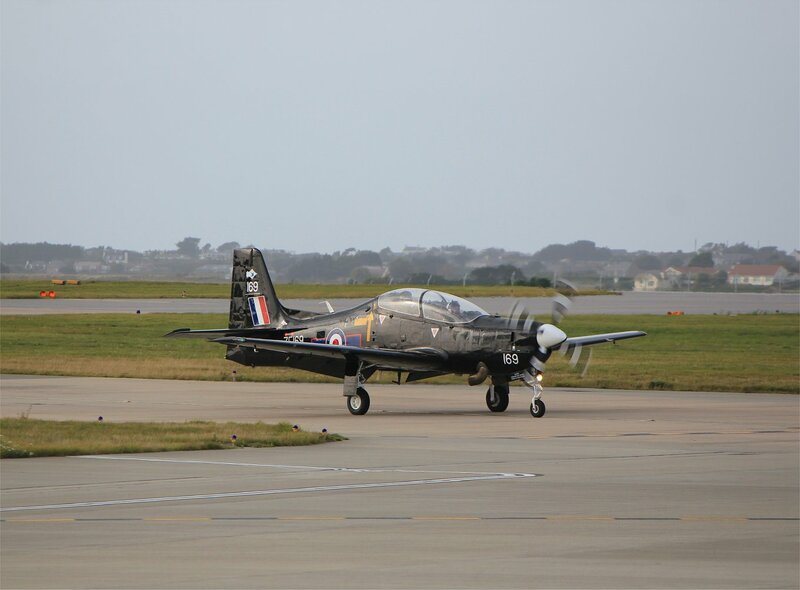 On another occasion we had taken the bus to the beach at St Ouen’s bay (near our favourite cafe, El Tico) which was just under a mile from the end of the airport runway. 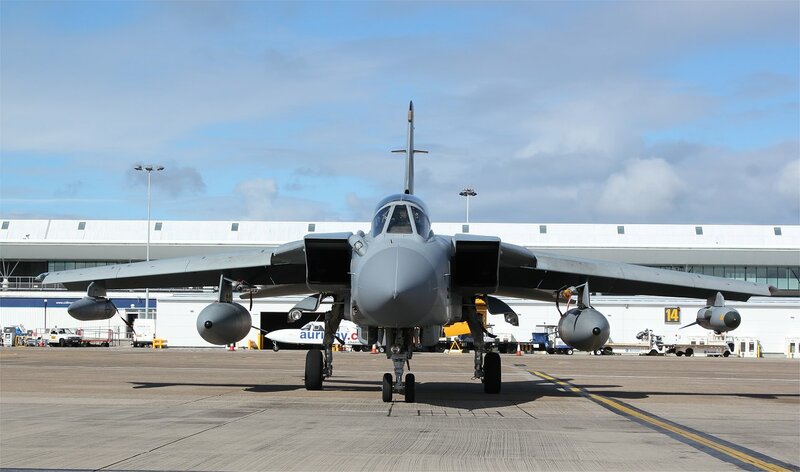 As it was the day after the air show many of the planes were making their way back home and we were surprised as a Lancaster and Spitfire took off right above us, followed by two Jaguars. 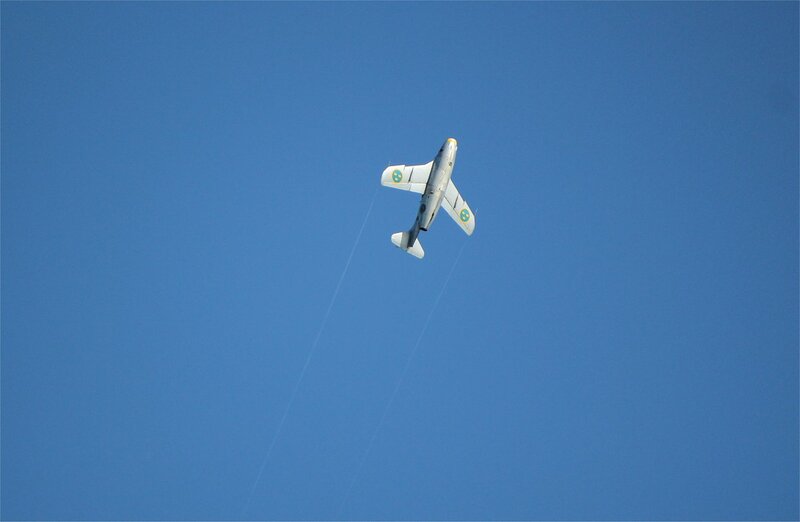 My brother, two years younger than me, ducked as they passed far overhead!